This page contains several sub-parts, as the covered period would be too long for one continuous text. For each part we put the period on top, and the parts are top-down with the newest one on top. 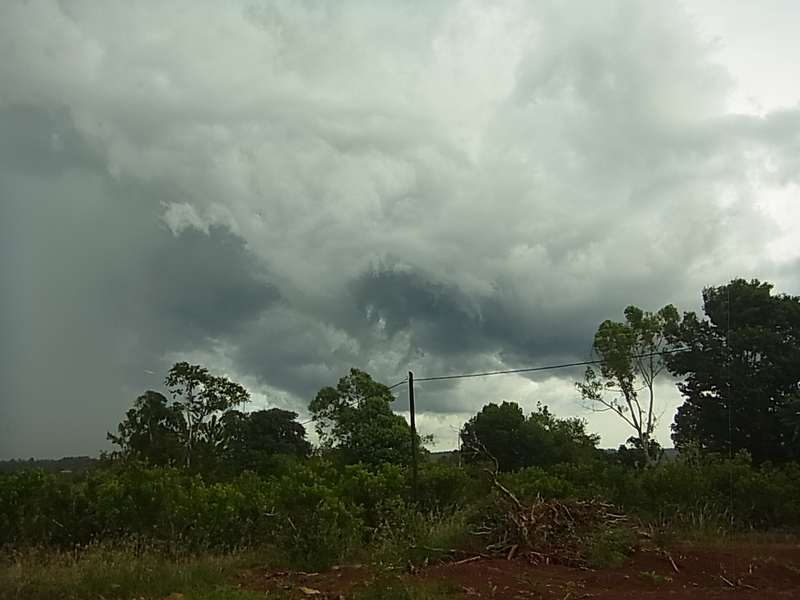 Moving on after these lazy days is not easy and bad weather doesn´t help. 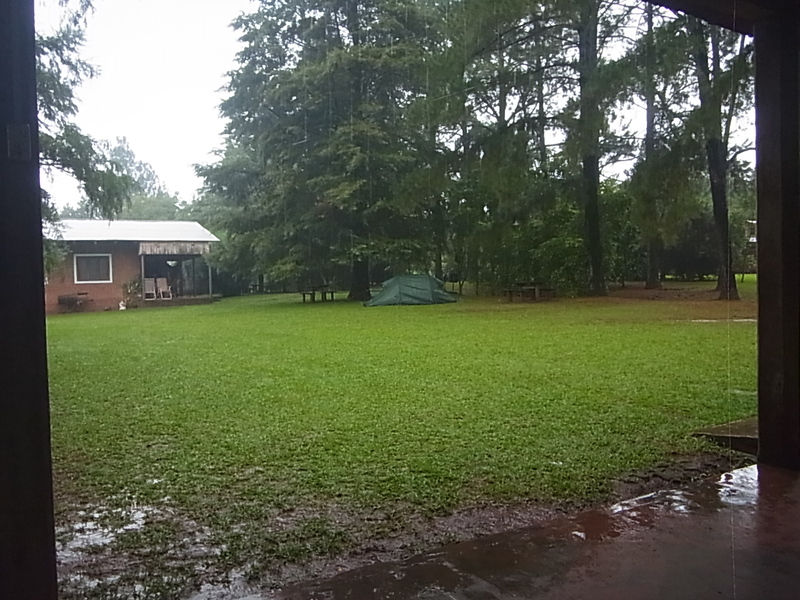 Rain in the afternoon forces us to seek shelter and luckily we get invited by a friendly family to sit under their patio until it passes, but it looks like there will be more rain later on and we have to think where to camp, eventually for two days if the rain doesn´t stop the following day. The area we are in is scarcely populated but densely overgrown and wildcamping is not possible. There should be a Camping around 20km further and we try to reach it before it´s dark, what will be around seven with all the grey clouds. Of course, like it´s always if one has a plan, nothing works out the way it should. 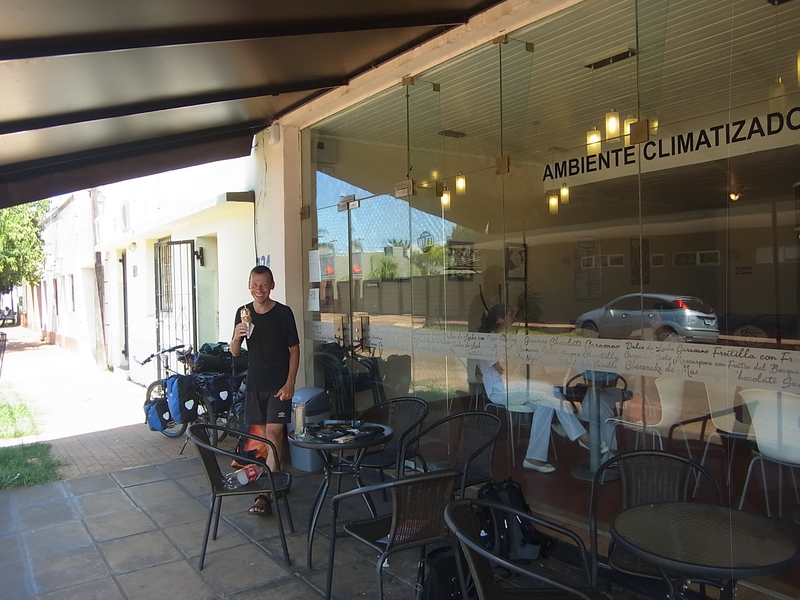 At six we still have ten km to go as we pass by a supermercado, decide to stock up our supplies and have a cold drink. As usual we get to chat a bit with the locals, who say that it should be possible to camp at the local gas station, with toilets and showers, and only 200m away instead of 10km – of course we choose this option but at the station though, there is no place to put up a tent and the owner points us to a nearby lake with surrounding grassland. 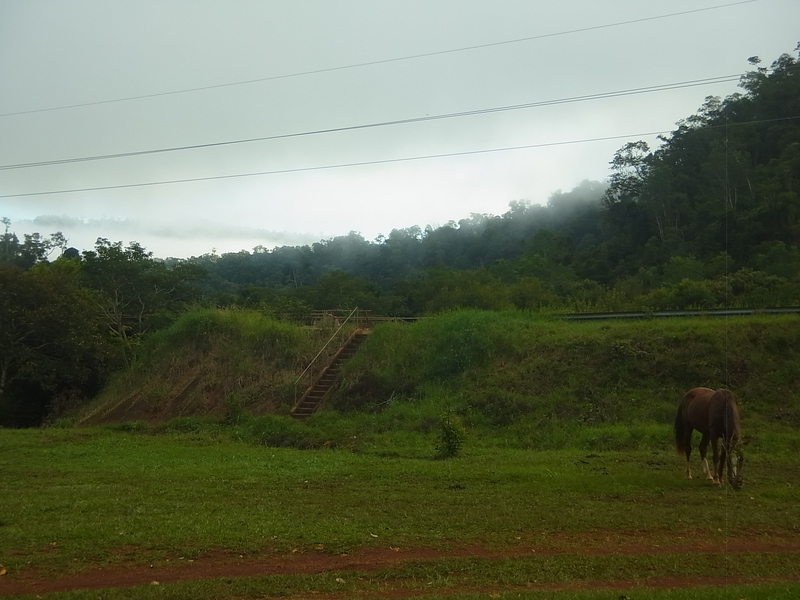 Arriving there, the gate is closed and says ´prohibido pasar – propriedad privada´ so we have to get back – 1km steep uphill – to the main road. 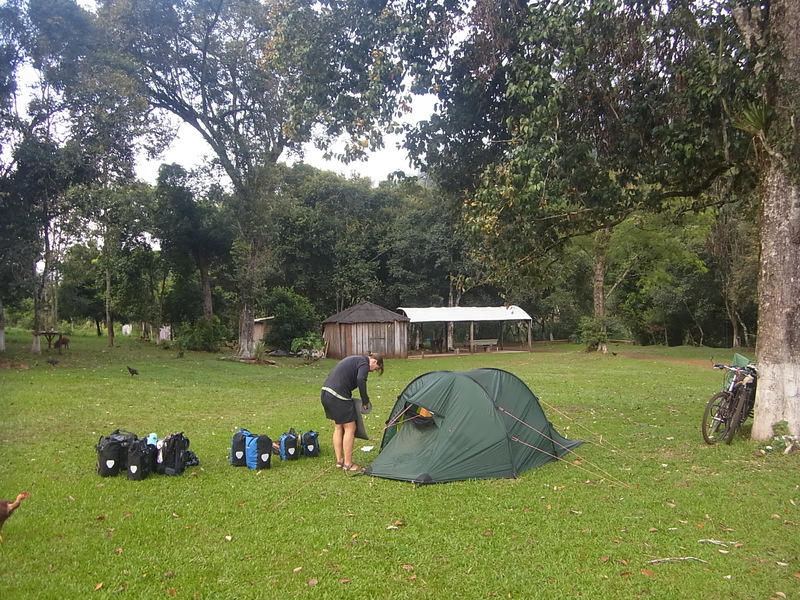 At this time night and raindrops start to fall, the Camping is for sure too far and we simply ask at the first house we pass if we can put our tent on the grass in front of their property. Step by step we get used to knock on private doors and ask for help and luckily we only had good expierences up to now, mostly with even more offers and kindness as we hoped for. The last night before Irigoyen we got an table with chairs and some pizza, this time the “extra” is the welcome use of toilet and shower. 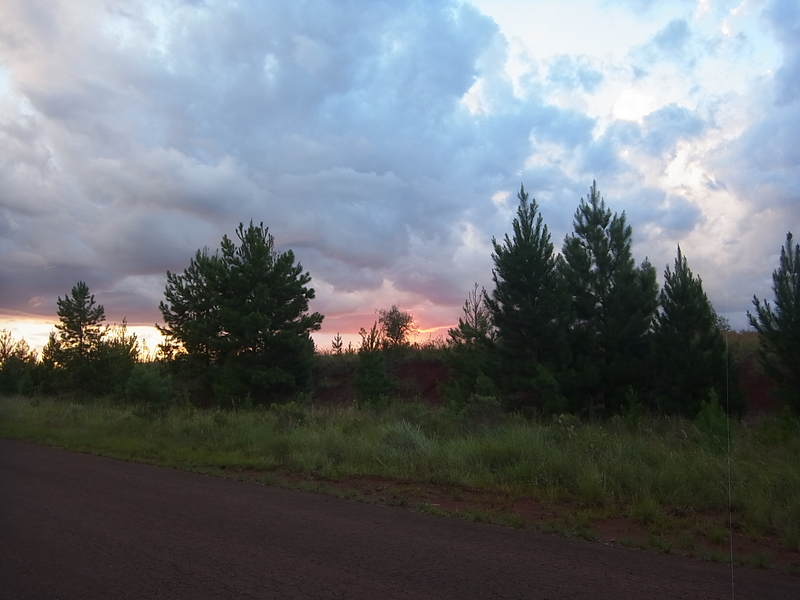 Next morning, after an early rain shower, we head further north and riding is not that bad today. 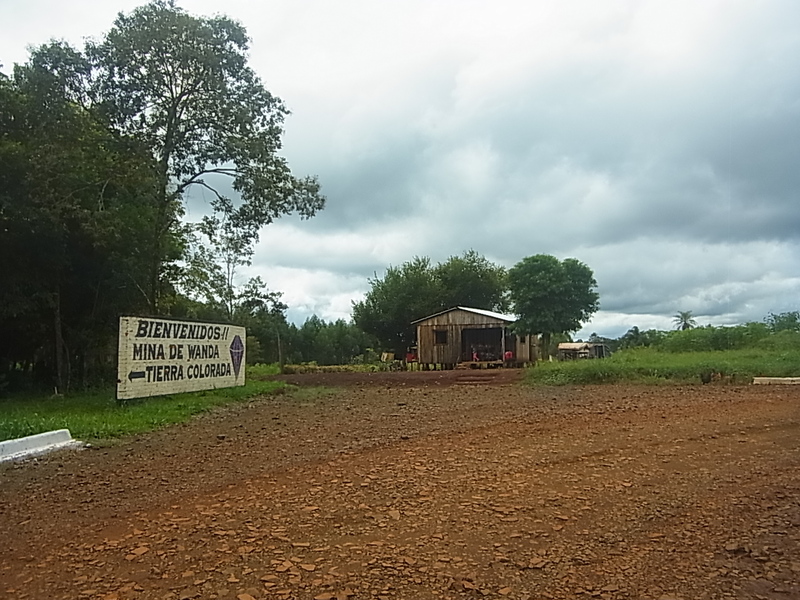 When reaching Deseado, which according to our map should be the biggest village on the road, we are rather disappointed: the village is no more than one despensa with a few houses and we have to move on to Andresito, the biggest town nearby but not really on the way as we planned it. 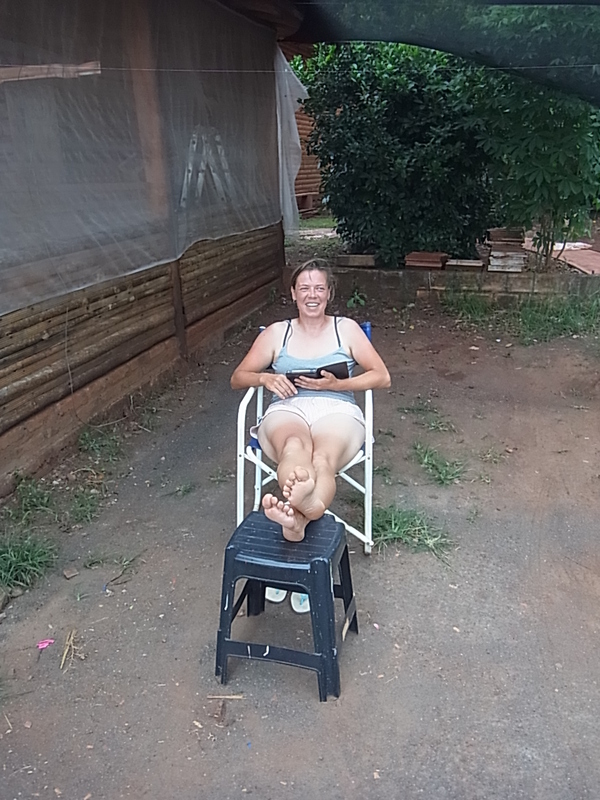 In Andresito (which is surrounded by big plantations of Yerba Mate) we find a hospedaje at the town entrance with a supermarket nearby, so no questions asked: we found our place for tonight. 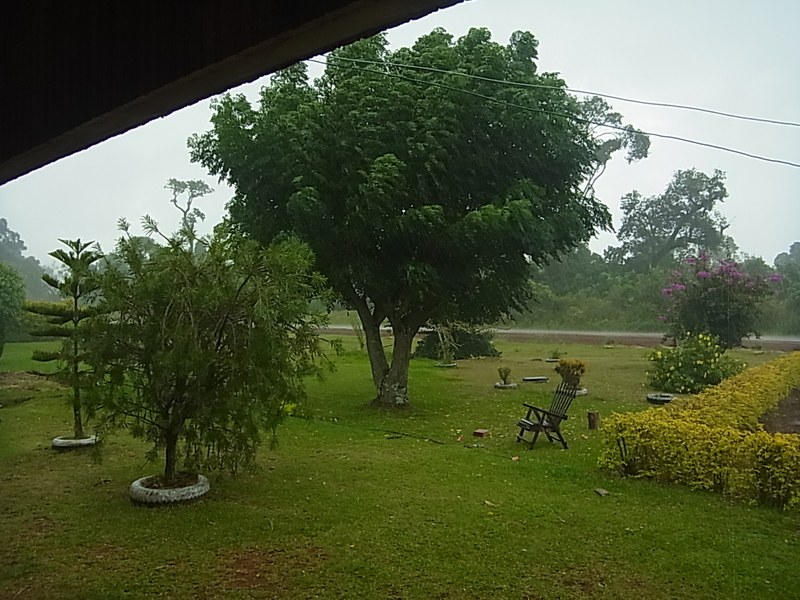 Late afternoon brings a huge thunderstorm with lots and lots of rain, so we are glad to be inside and not cycling. 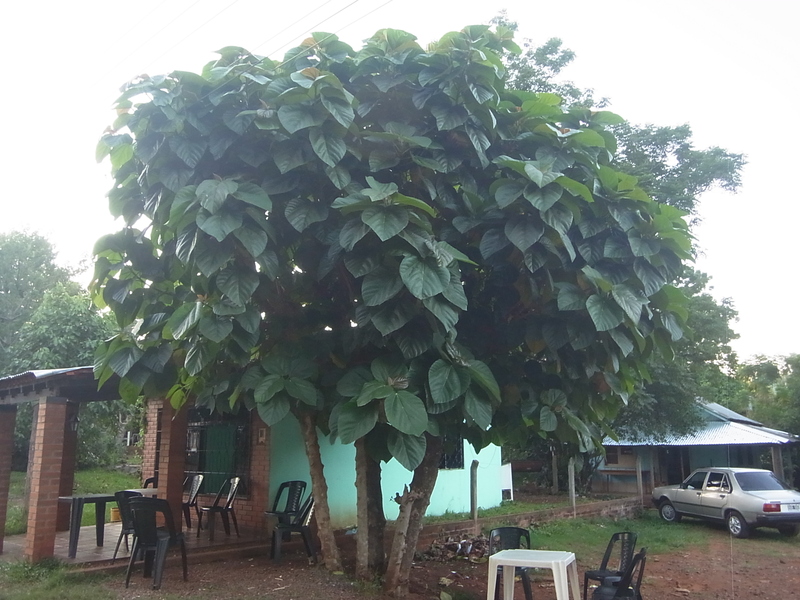 We spend two nights at the hospedaje ´Tierra Verde´, and we spend the day as always: playing games, sitting around, relaxing a bit, taking shelter from the rain which comes in showers but always heavy and cooking delicious food. 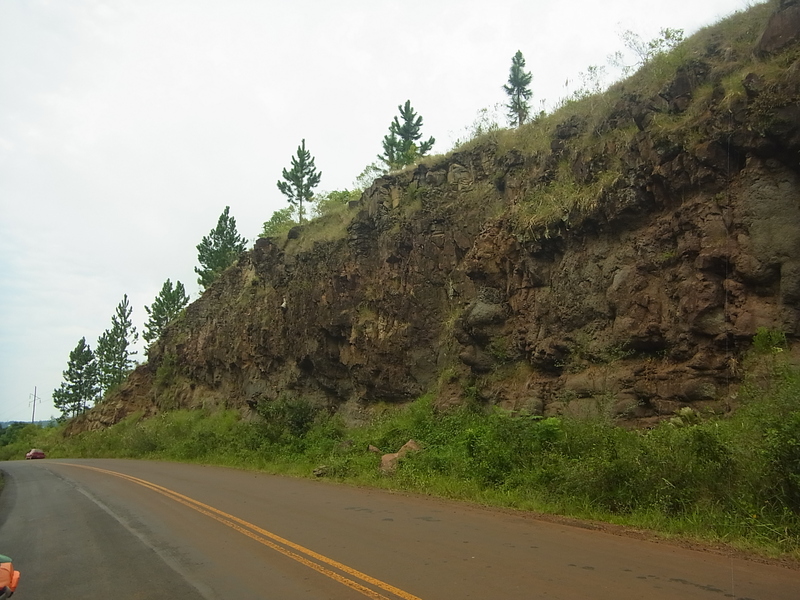 A bit further down the road we pass the limit of the Urugua-i Parque Provincial, the largest of the 69 Areas Naturales Protegidas in Misiones. 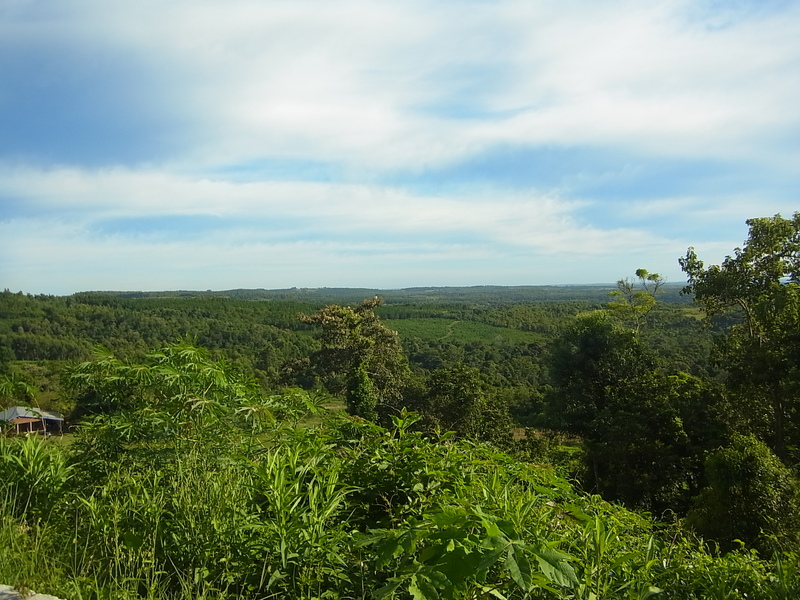 The road through the park is somewhat 32km long and again, the original subtropical forest is a pleasure for the eyes. 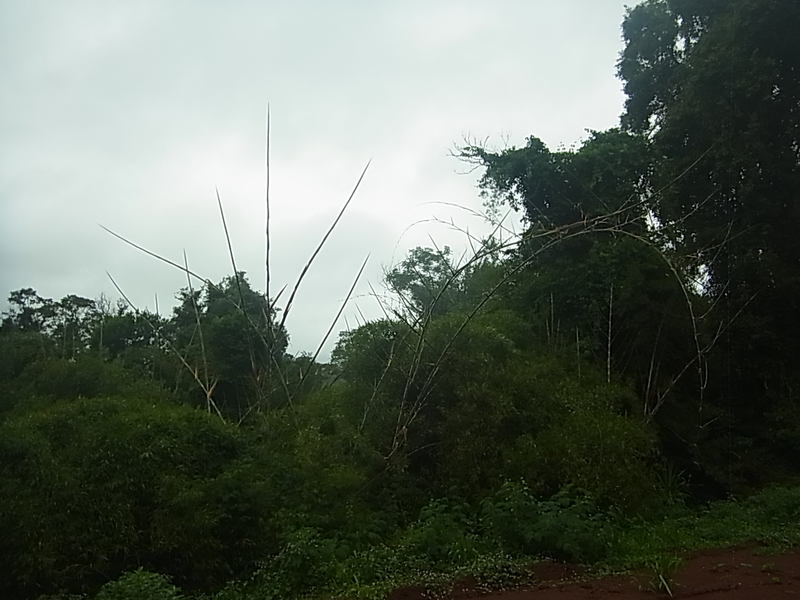 Dense vegetation, all kinds of different plants growing side by side, next to and on each other, leaving rarely any space for light and some animals to pass through. Halfway through the park we are totally wet and cold and have to stop in the Ecologia of the Parque, which turns out to be the place where the Guarda Parque live when they are on duty. We chat a bit with one of them, and decide to take the Collectivo (bus) to Wanda but when the bus finally arrives, he doesn´t even stop for us, he just slows down a bit and than takes off again – not willing to take bicycles ? While having lunch a white pick-up stops on the bus-lane and we take our chance and ask for a ride. 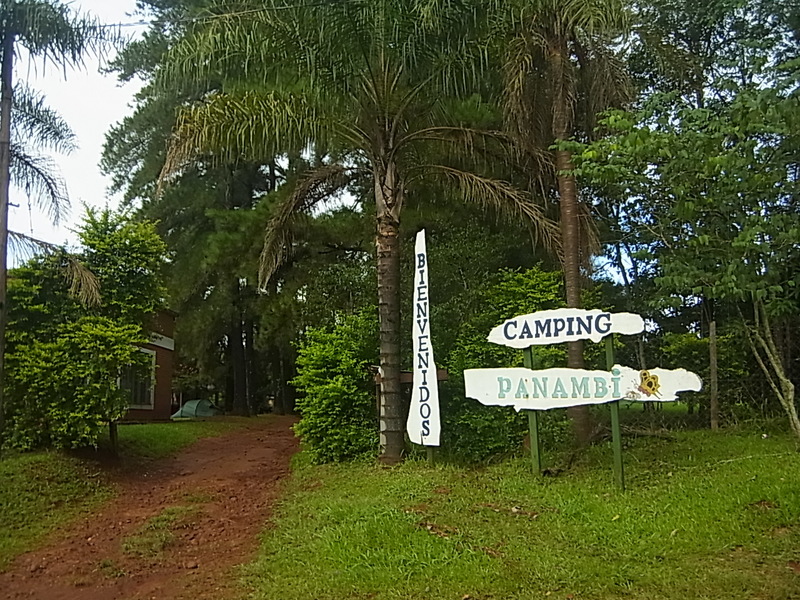 Camping Panambi is – as the first one in Panambi itself – a nice and quiet one and we are the only guests, probably due to the bad weather. 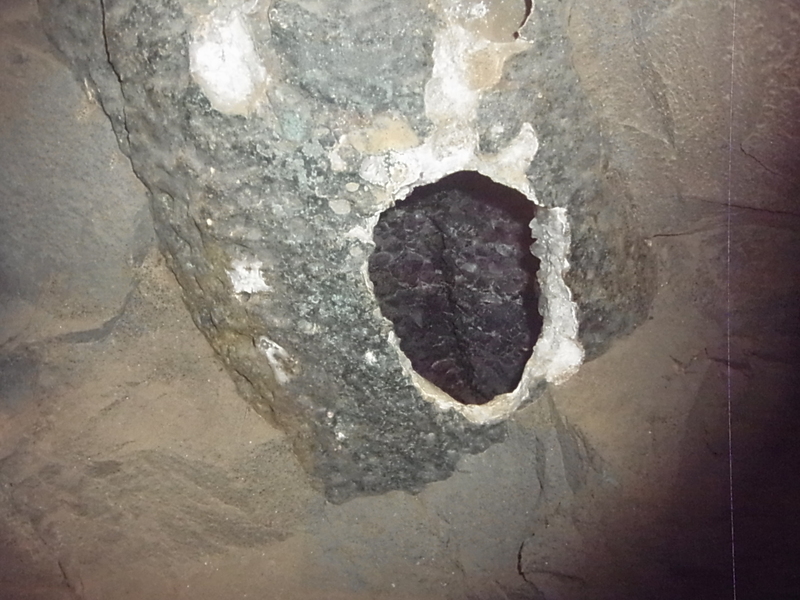 We stay for two nights and visit one of the Minas de Wanda, the mine ´Tierra Colorado´. 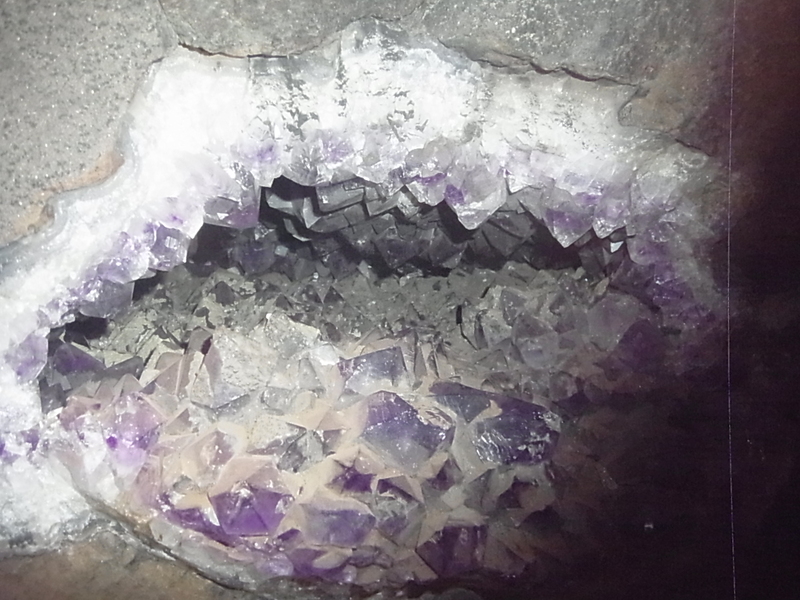 It´s one of the biggest mines of the region and it exploits Amethysts and Mountaincrystals. 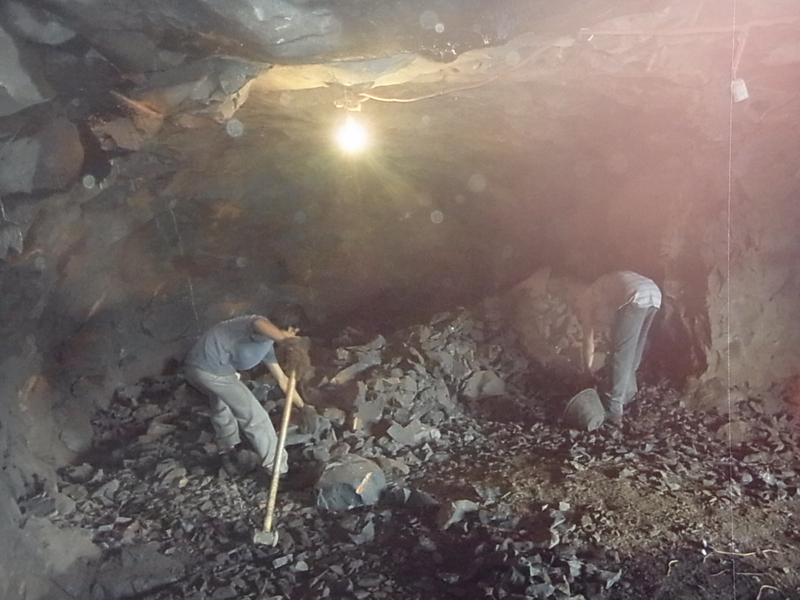 For the worker it´s hard labour, they have to hammer the bubbles of precious stones out of the hard basalt only with manpower and no machines and on top the leftover basalt has to be smashed to small pieces, so it can be used for building roads. 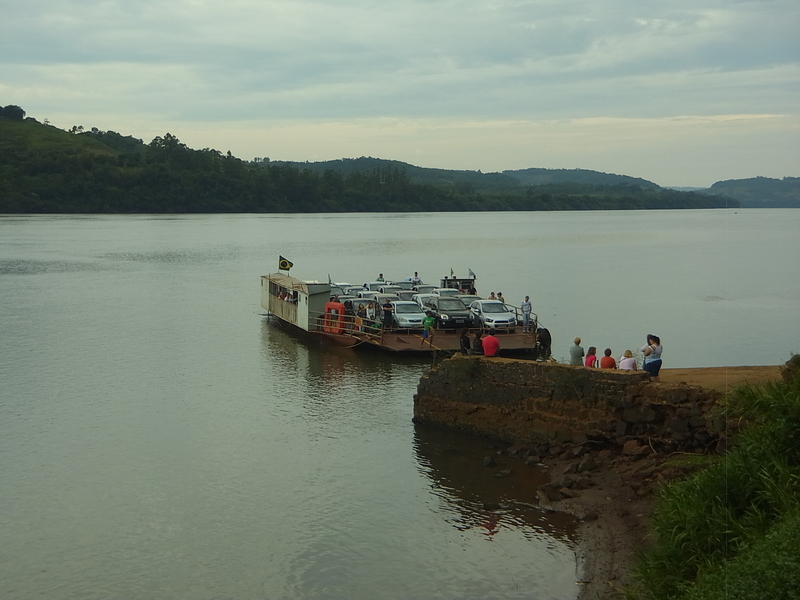 The final leg to Iguazu is only one easy day more and halfway through, we already enter the Nationalpark which surrounds the waterfalls. 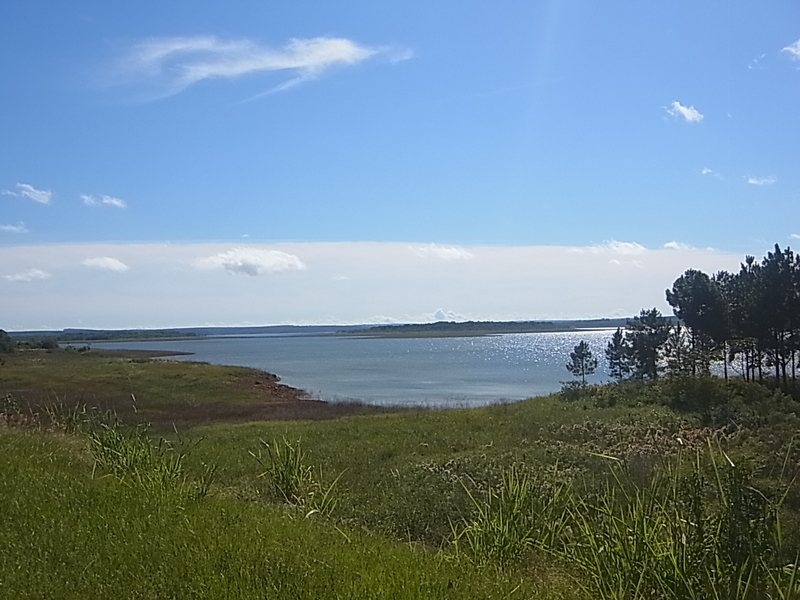 When we leave El Soberbio we also leave the Rio Uruguay and cycle inland in direction of San Vicente because we have to go around the Nationalpark of Mocona. 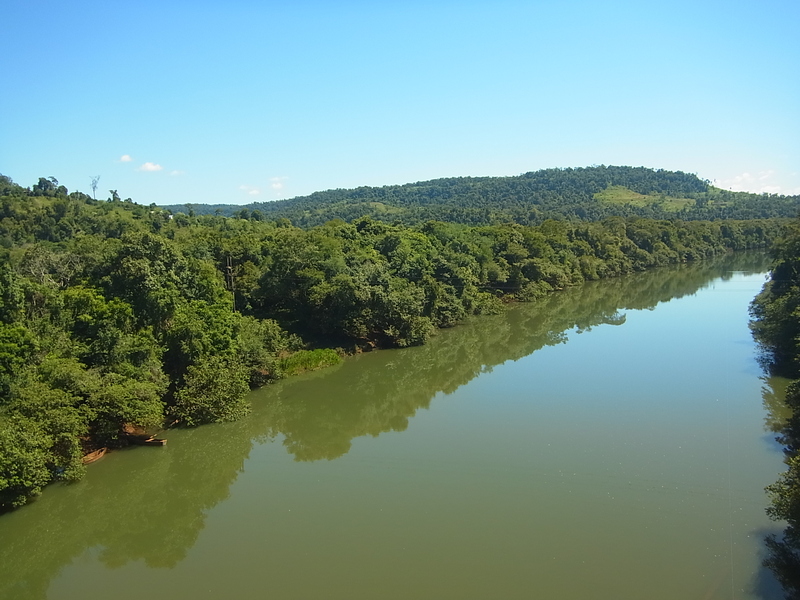 Cycling inland means also more and steeper hills, since Misiones is build like a triangle, with the lowest parts at the bordering rivers to the west and the east and the highest part in the middle, running parallel to the rivers. We start cycling to a cloudy sky, it rained the night before and there was a lot of mist in the morning, which is in this area a typical sign of coming autumn. 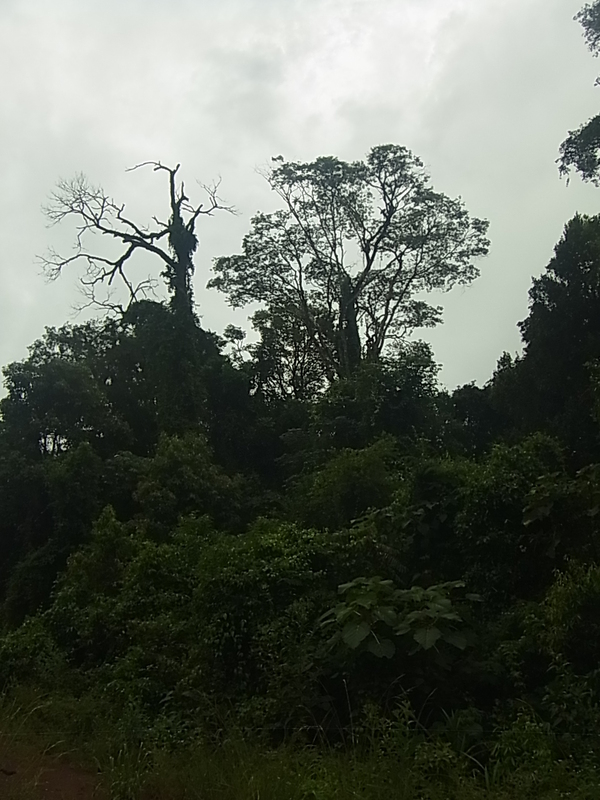 But climbing hill after hill makes us sweat even without sun and a small rainshower in early afternoon refreshes the air. 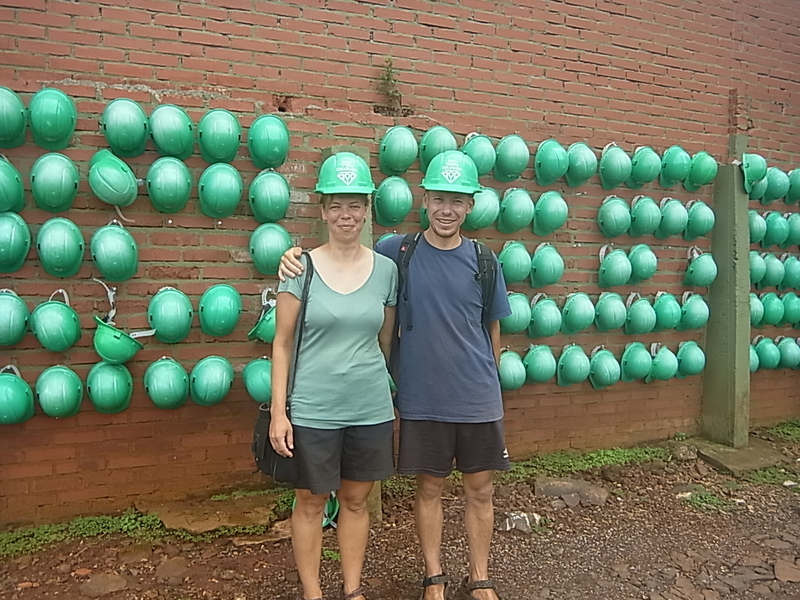 We are a little bit surprised but happy to reach San Vicente after a last steep climb already around 5pm and ask in a bicycle shop for a Camping. There is none in town, but we are sent to the “Bomberos voluntarios” (funny name, it sounds like the opposite of their real profession) and can camp on their ground. A good hint for future searches of sleeping places! As a change we have a fantastic view over the whole surrounding landscape, long chains of hills, slightly descending to both sides. 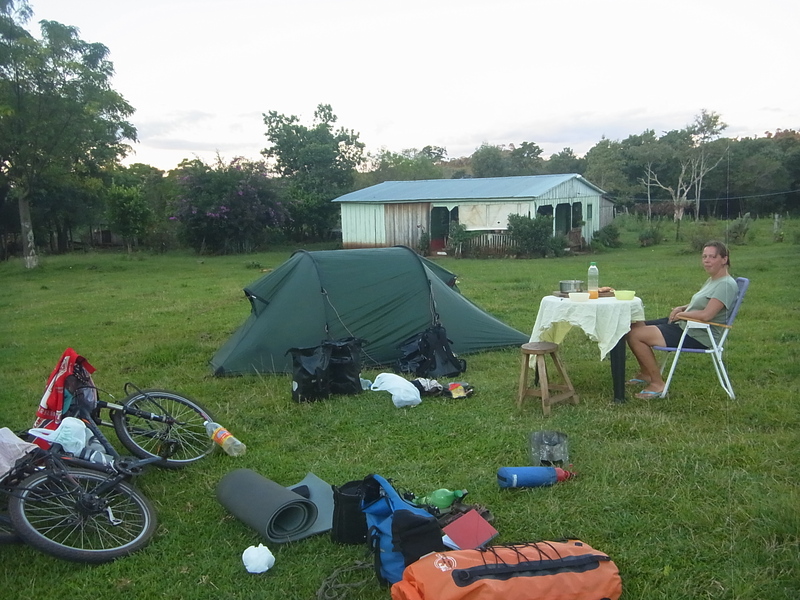 Around noon we´ve cycled already 40km and stop next to a little church in Fracran for Siesta and our daily routine of tent drying. 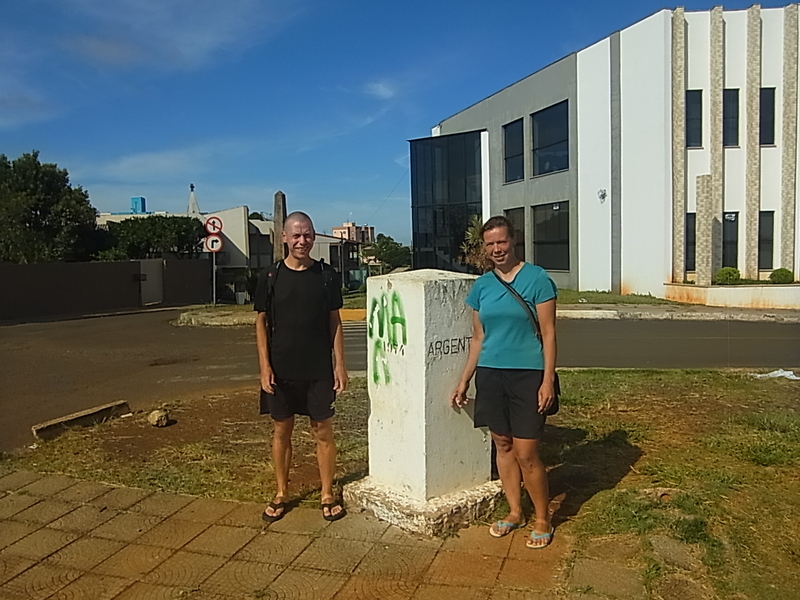 Three hours later, shortly before leaving the place, Bram walks to the gas station in search of white gas for our fuel cooker and gets as usually involved in conversation with some locals. One of them being Otto Umfuehrer whose parents were Germans and who is so happy to be able to practice his german that he immediately invites us for Mate. What should be a visit of about an hour (since we planned to reach San Pedro 28km further this day) turned out to be the final stop. We drank Mate, talked about god and the world and then it was too late to move on and Otto offered us a place in his garden which we thankfully accepted. Later on, his wife Ivonni returned from a visit to her daughter, and brought their grandchild Martin along. Ivonni was even more excited to see some German-speaking people, and offered us dinner, warm shower and a bed – their own bed while they would sleep in the guestroom with Martin – and “no” wasn´t accepted as an answer. The next morning brings bad news: in the night the babysitter of Martin, a 14-year-old girl, has passed away, so Ivonni leaves early with Martin to pay a last visit to the girl before they take her away. 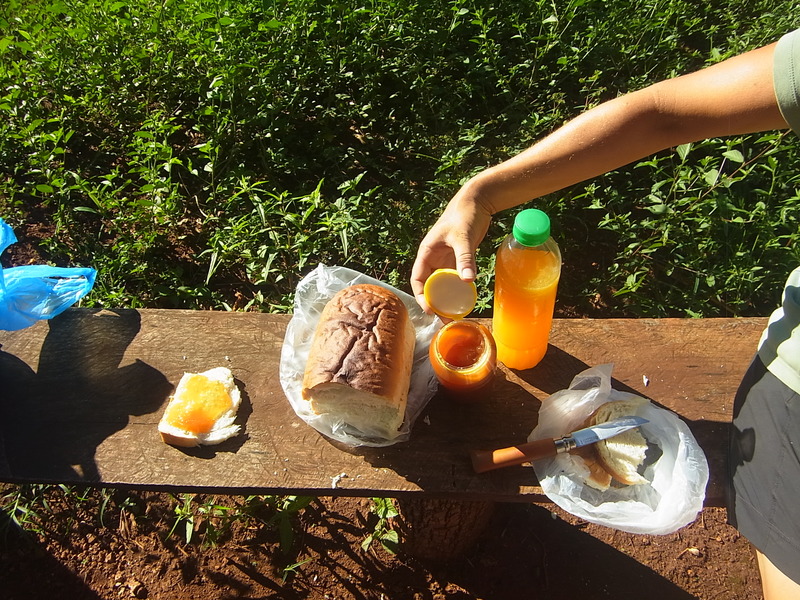 We set out to leave after breakfast – Mate with biscuits – and take along the gifts we received from Otto: 2kg of honey he harvested himself from bees 20km inside the rainforest and 2 litres of fresh Passionfruit-juice, what a treat! 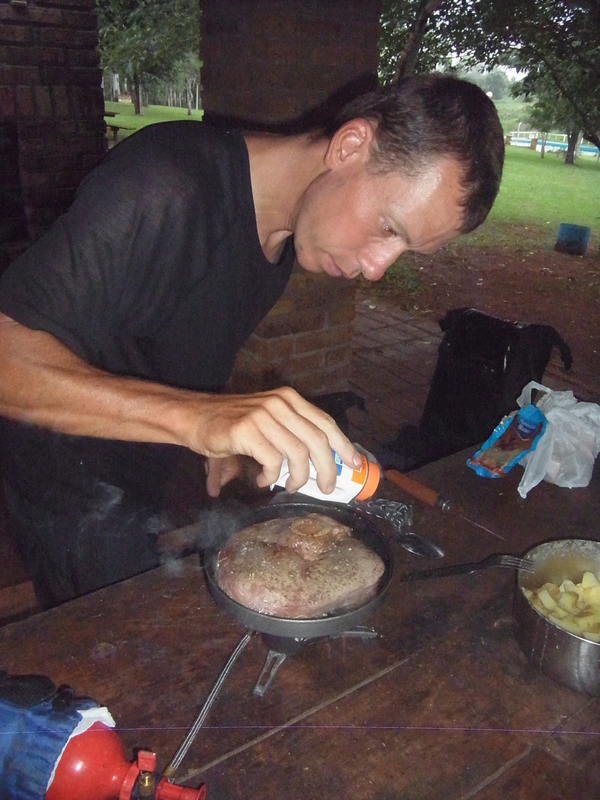 Two days and 140km later the juice is gone (the honey lasted much longer!) 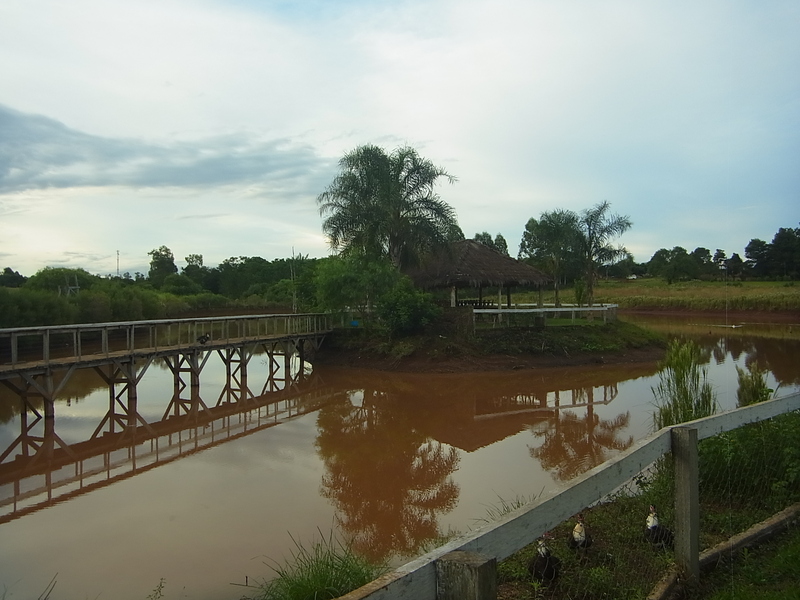 and we arrive in Bernardo de Irigoyen, back at the brasilian border. 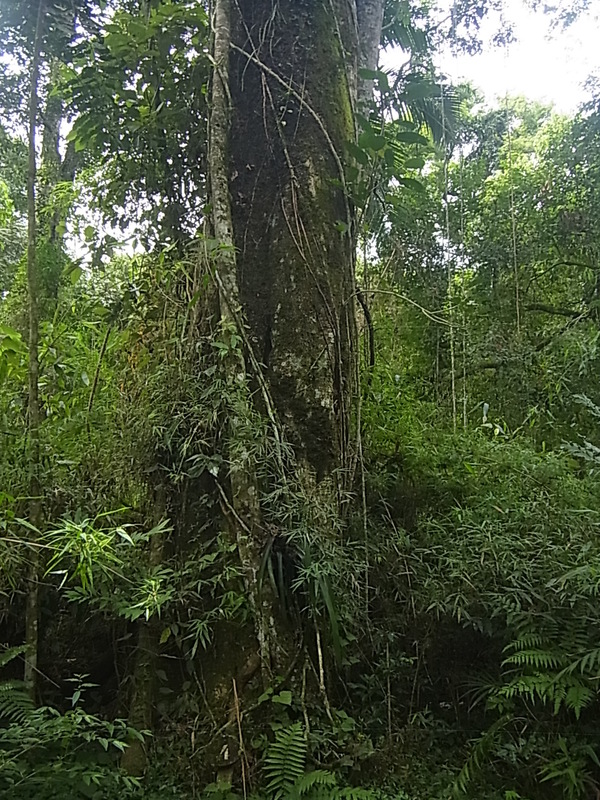 Two exhausting days, in which we passed a long stretch of mountainous but very beautiful subtropical forest and more nice sights along the road. 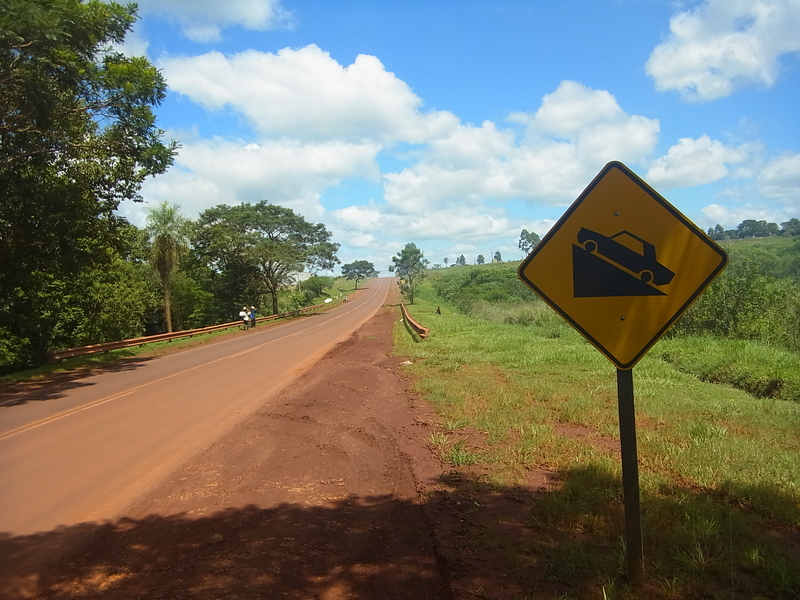 At this point we decide to go the longer route via Irigoyen for three reasons: we can avoid hitting the big busy Ruta 12 which heads north at the western side of Misiones to Iguazu for much longer, we ran nearly out of money and exchanging brasilian Reales in argentinian Pesos gives a better exchange rate than cash withdrawal with the credit card in Argentina and last but not least: we like Brasil and look forward to spend there a few more days. 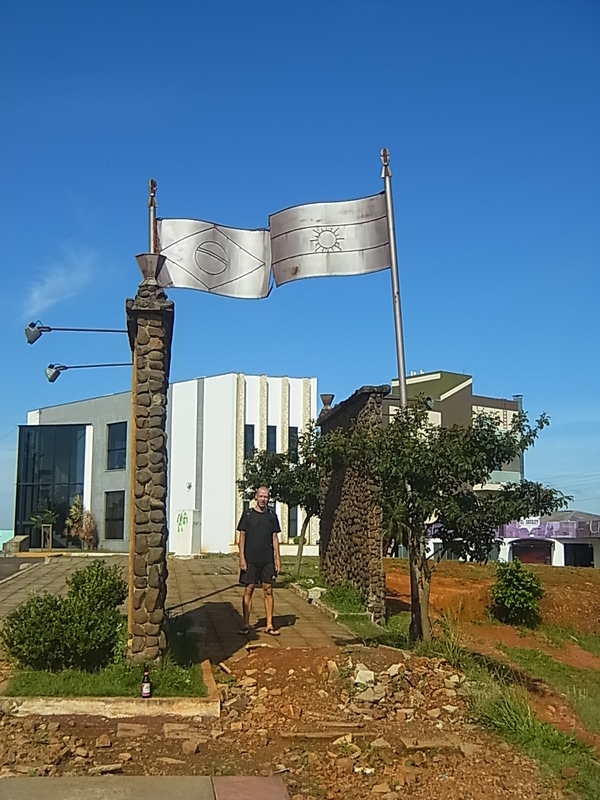 We cross the border to Barracao-Dionisio Cinqueira in Brasilia and check in at “Hotel Iguacu”, a tip we got from the swiss man we met in El Soberbio. 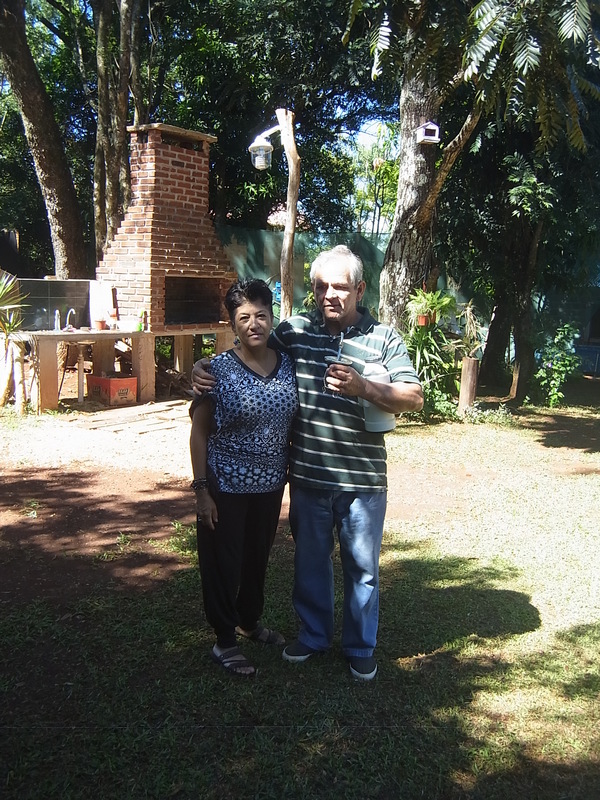 We stay for three nights in the hotel and spend some time with exploring the city on argentinian and brasilian side. 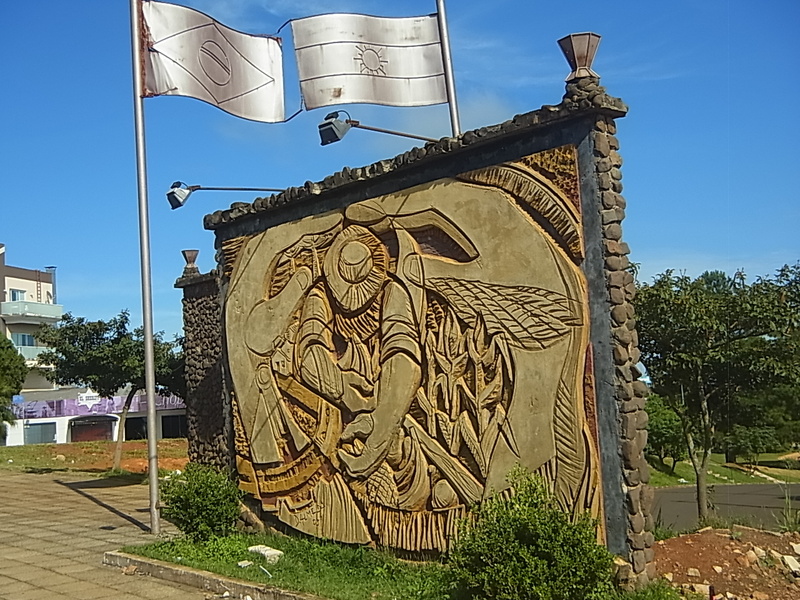 There is also an official aduana (border control), but crossing is no big thing, there is a walking path that goes around the aduana and people even cross it for buying bread. 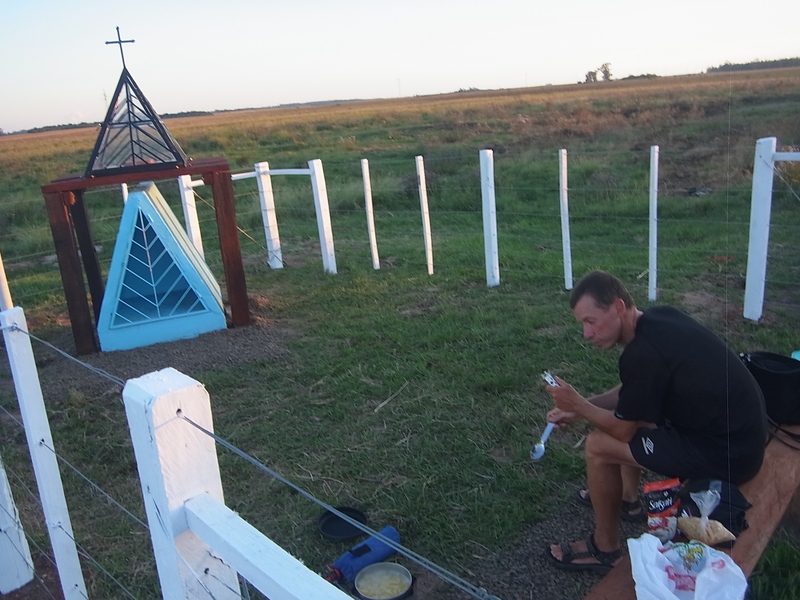 The next days we follow the Ruta 2 (or Ruta costadera as the locals call it) more or less along the Rio Uruguay further up north. 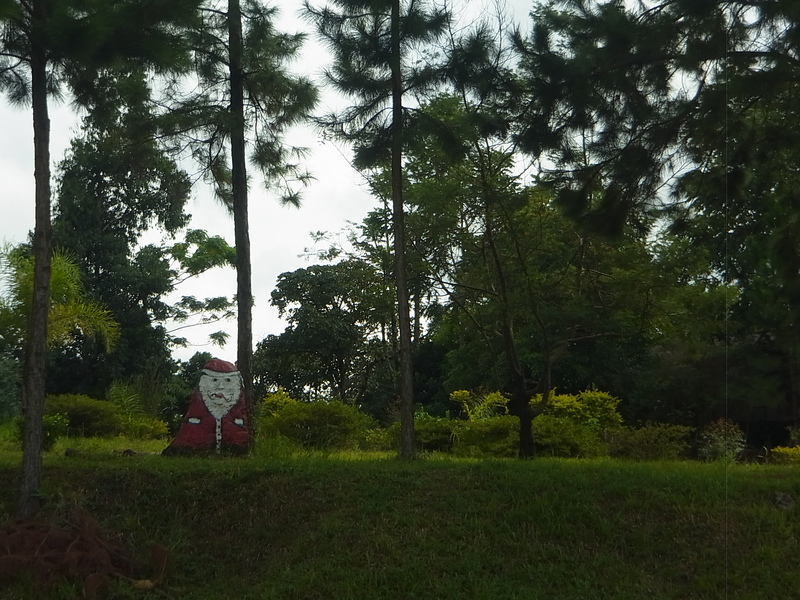 We pass several small villages, some of them directly by the road, some a little bit by the side. 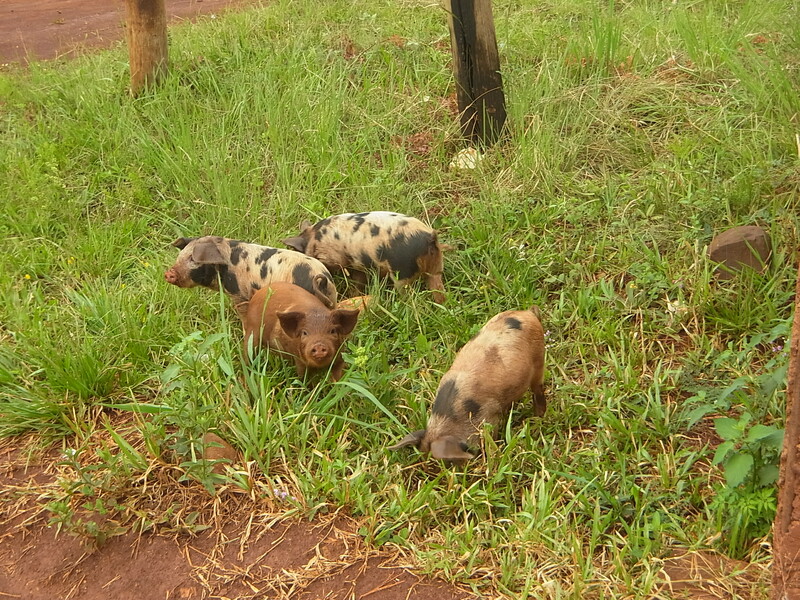 It´s always a little bit quizzical how far away from the road they are and if we should visit them or better not. 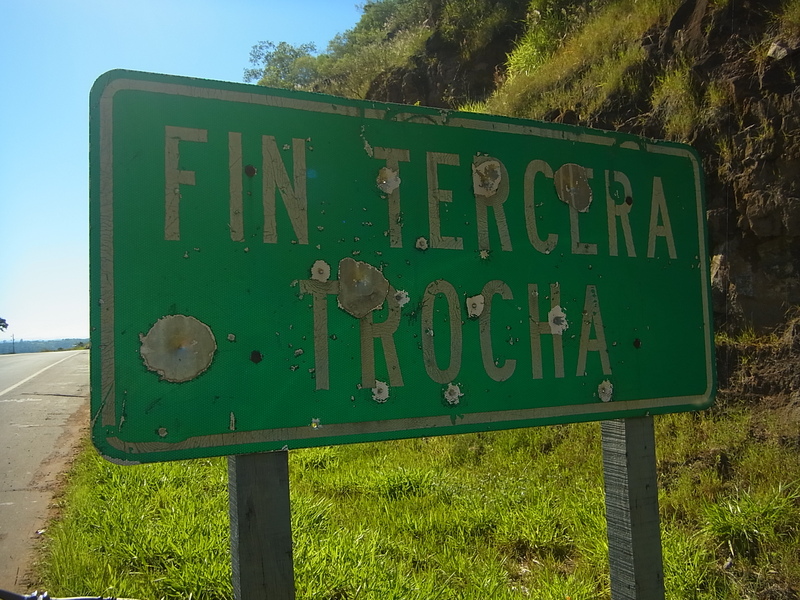 The signs for San Javier for example says: 11km aside the road, 50m further the next sign says only 10km, one km further again a sign with 11km. A bit further down the road the same trick with 6 and 7km. 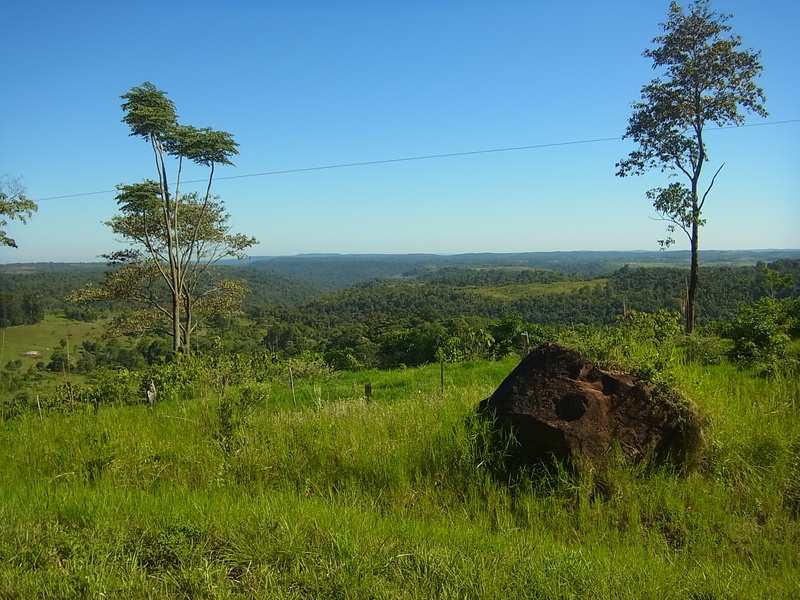 As the area is very hilly and every km counts, we decide not to visit it but have a little rest in the shadow of some trees in front of a private house. After some 10min the owners appear, and after a little chat they invite us in their garden which is a playground and party location for kids (including a deathride). 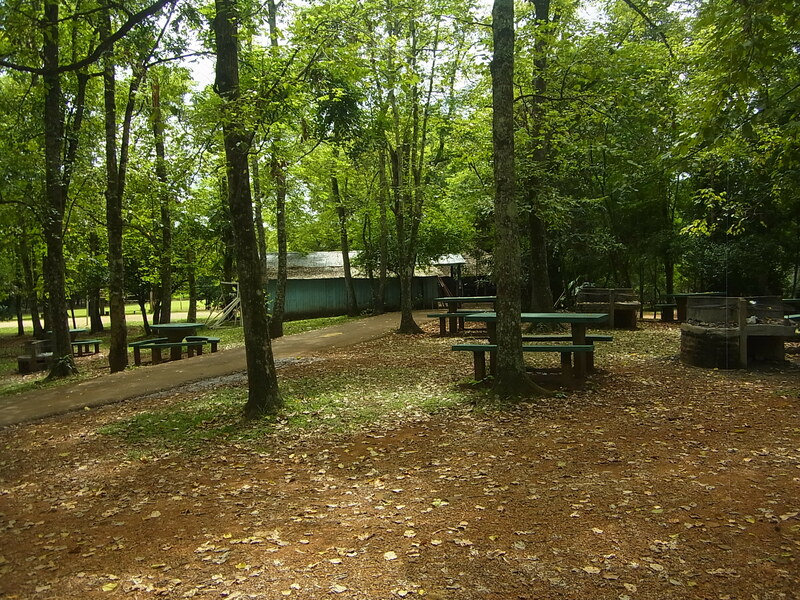 They offer us “pan de queso” and the use of the kitchen, toilet and bathroom, tell us we can stay as long as we want and disappear then. We are a little bit overwhelmed by this trust and stay for one hour. It´s only 11AM otherwise we would have loved to stay overnight. Instead we cycle on and the day passes very fast. 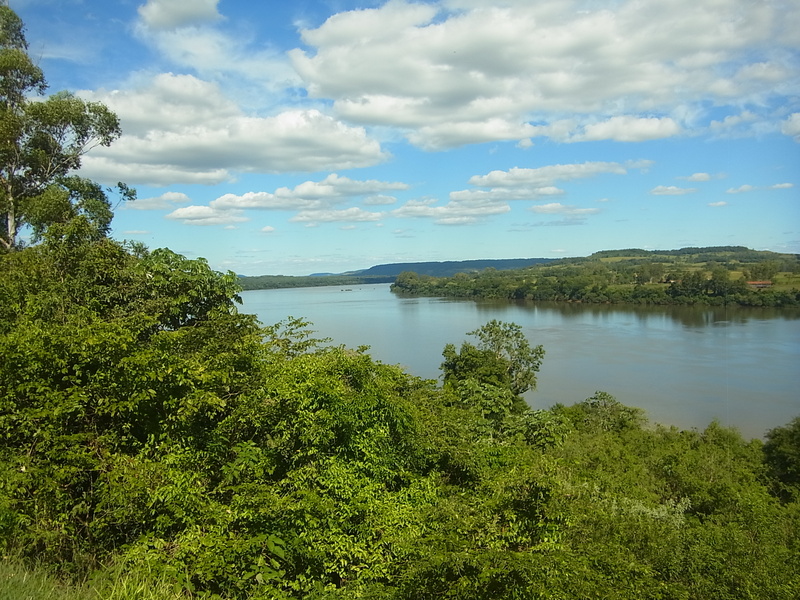 The surrounding is nice, from time to time we see the river, in between we pass dense parts of natural forest and every few kilometers there are small pueblos or farms and we can see people working or sitting in the shadows of their houses, very often with the radio playing at full volume. 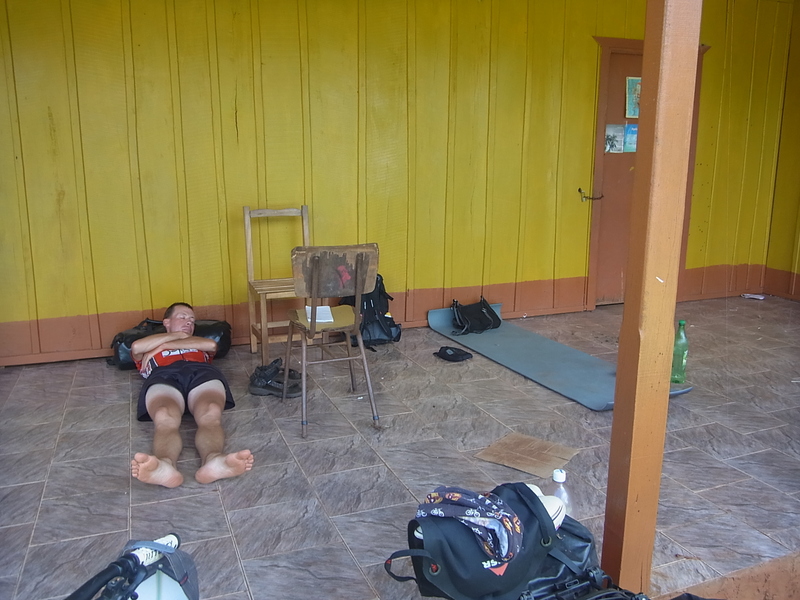 We get tired early and start looking for a campsite around five, but it´s not easy. Of course, when you need one, there is none of the small churches or something similar, instead there is one hill after another. 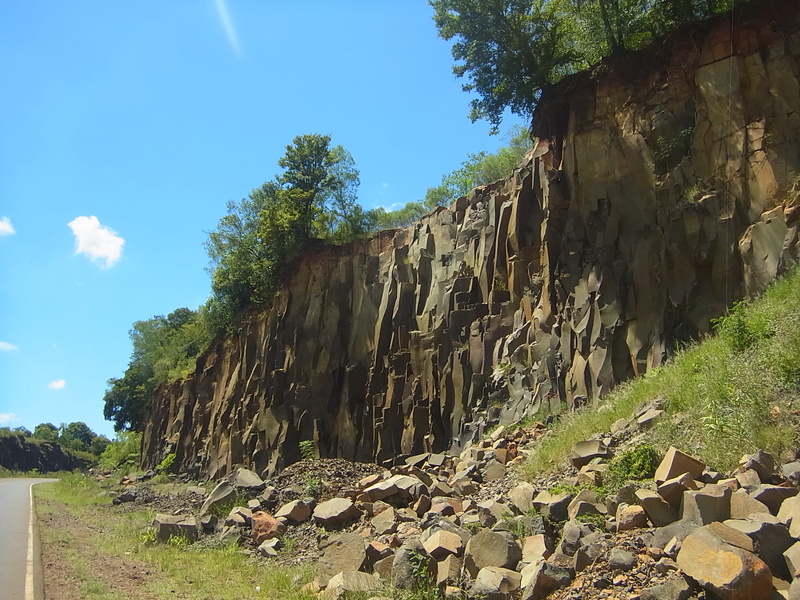 Around six we are still without campplace and face a rather steep and long climb. It turned out to be even worse than it looked. Two kms of steep climbing, almost too much for two tired cyclists, then our last energy is gone but we have to go on for another half an hour. Then we spot a house with a flat grass area around it and attempt to ask if we can camp there. 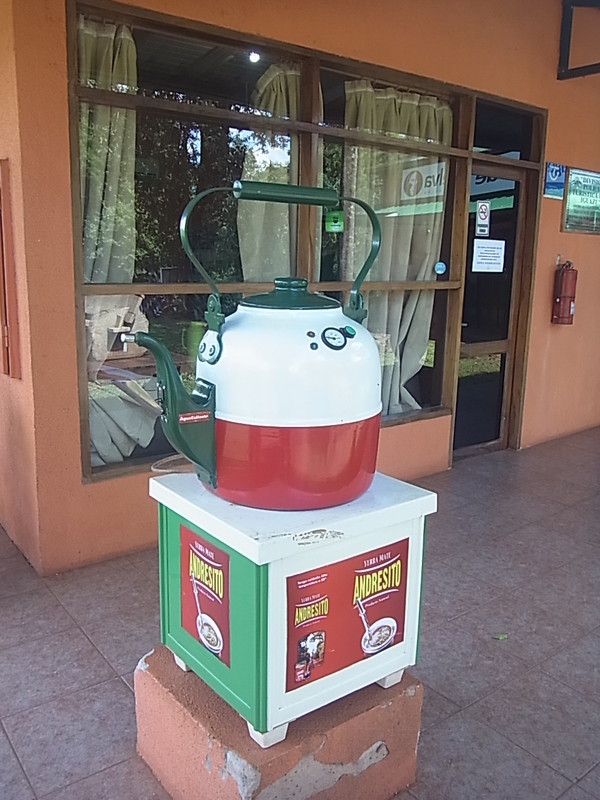 But as soon as we stop and set feet on the ground, before being able to ask anything, the owner already comes out and invites us for Mate (herbal tea). 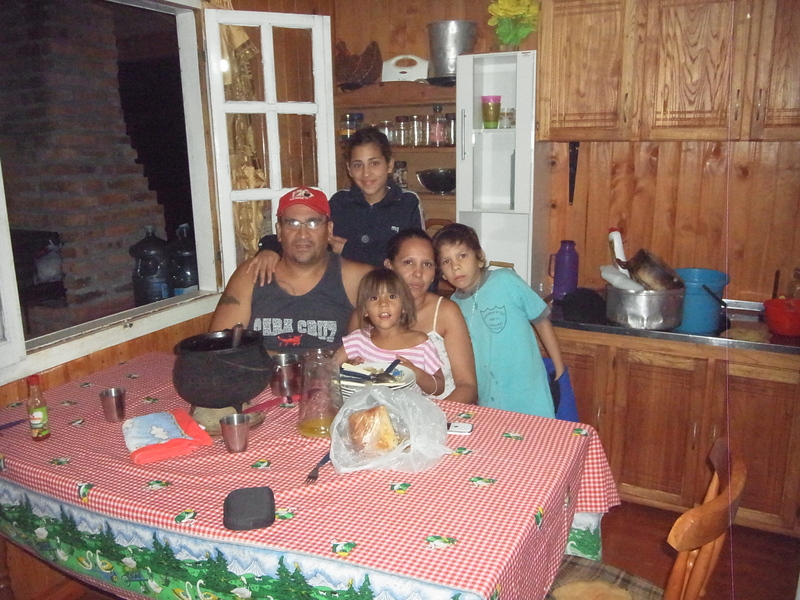 So we get to know Alfredo, his wife Romina and their three children. After a little bit of talking Alfredo starts cooking and we spend a pleasent evening with the family. As we ask how he prepared the food (some kind of stew with rice, vegetables and beef) he immediately packs us a little box with all spices and vegetables one needs and tells us where to buy the meat in town. 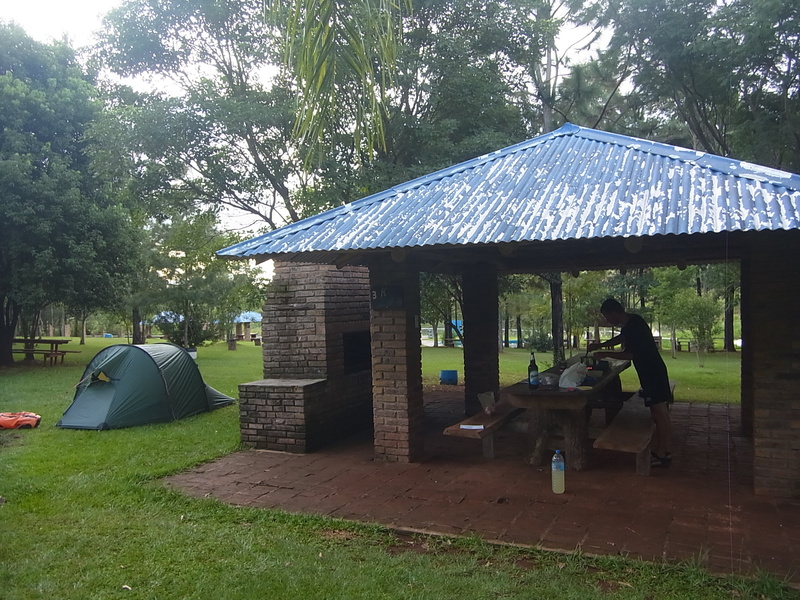 Of course, camping next to the house later on is no problem and we can also use the bathroom and have a cold shower. 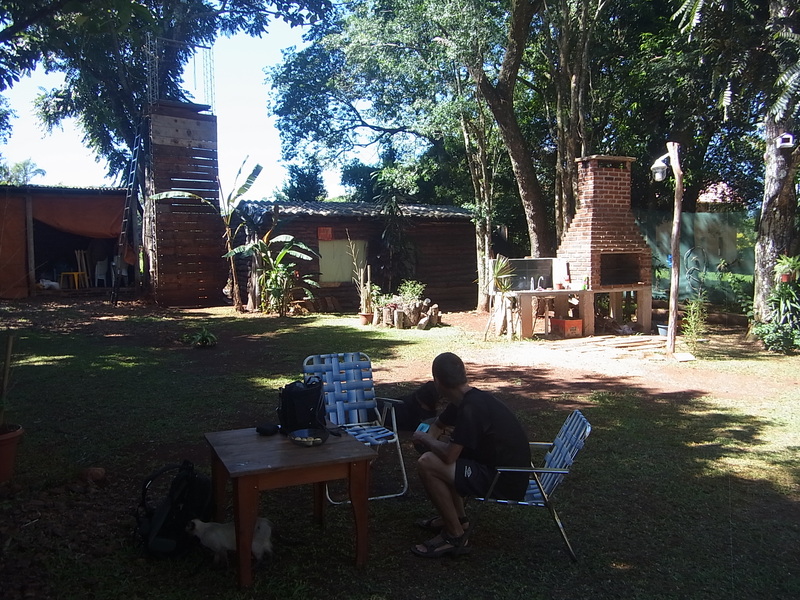 The next morning, during breakfast Alfredo tells us about the Camping Municipal in Panambi (which turns out to be only seven km away) and we leave alltogether. 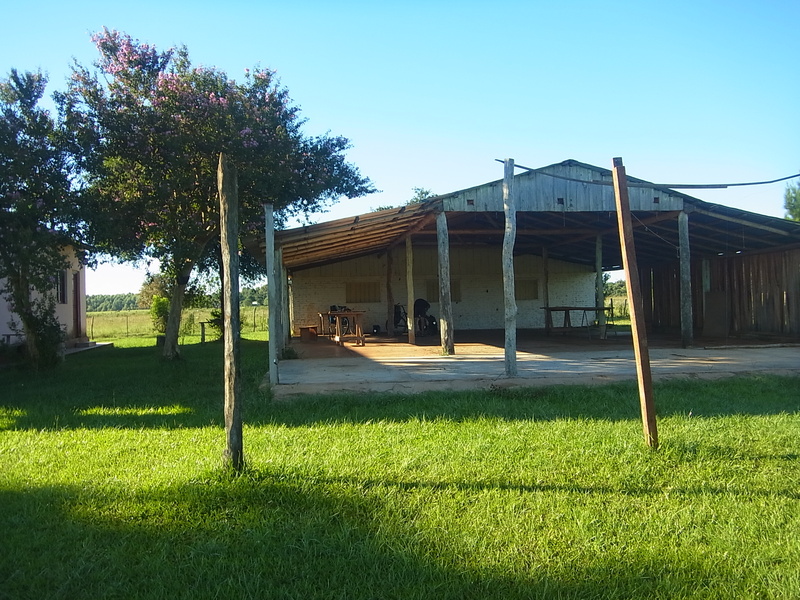 It´s Sunday, but the family runs a market stable with clothes they buy in Paraguay and sell in Argentina, so Sunday is not a resting day for them. 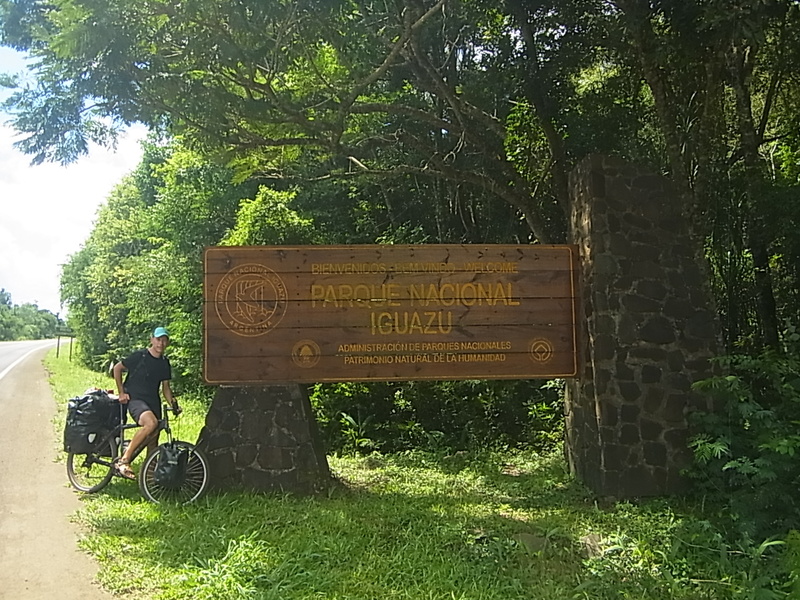 Going to Panambi is the easiest riding you´ll ever find, 6km downhill, we could have done it the evening before, but we didn´t know and Alfredo just mentioned it in the morning. We have lunch as well, try out the recipe we got from Alfredo and it tastes very good again. 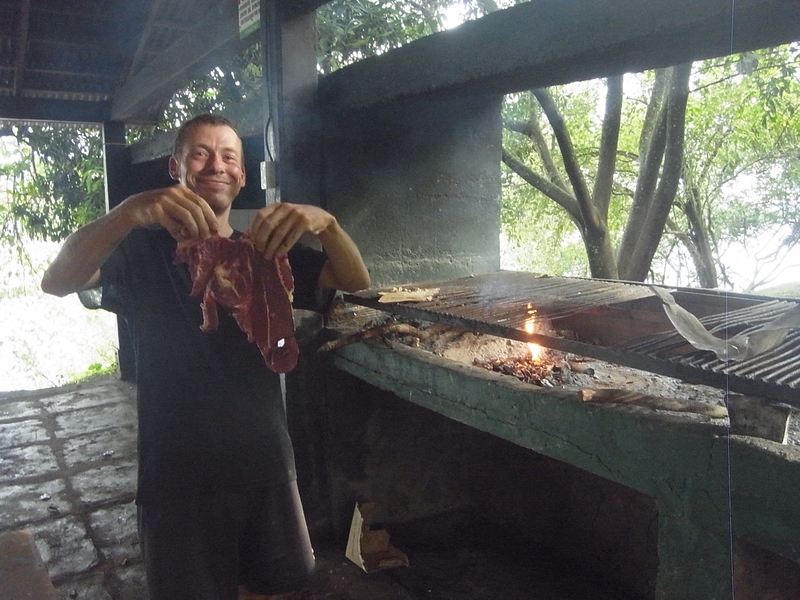 As we have some meat left but no charcoal, we ask our neighbours if we can use their grill and they do not only agree immediately but on top of that, we get also meat which they have left. The next day is Monday and the whole place is ours. 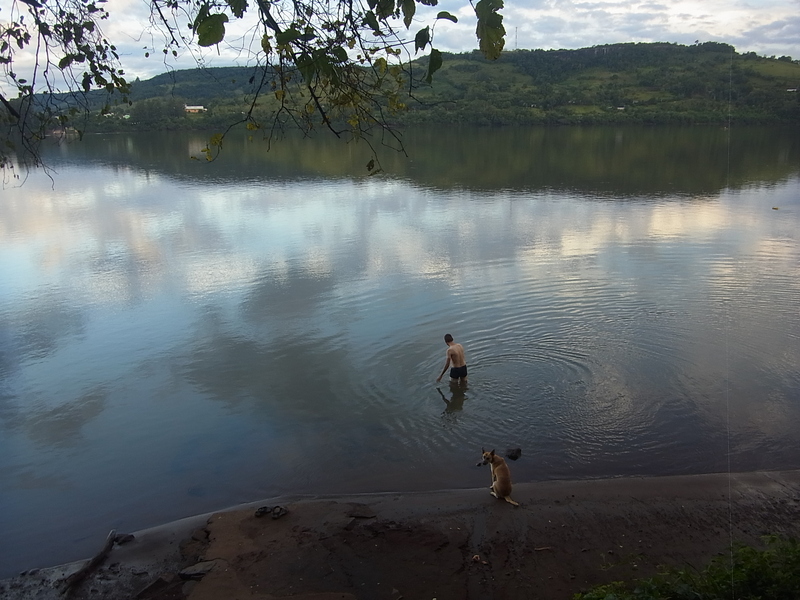 We relax, lie around in the shadows, watch the ferry boat which connects Argentina with Brazil (the dock lays right beside the camping) and just let time pass. 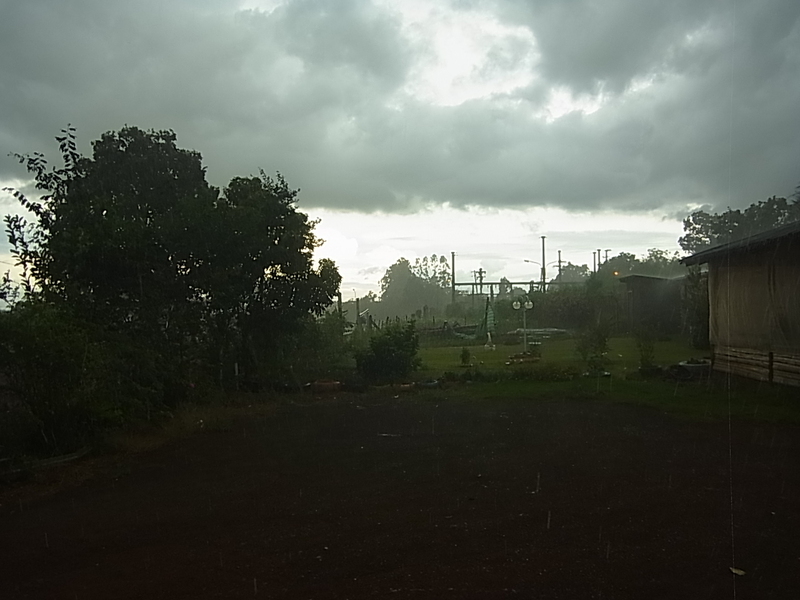 Evening brings heavy rain which lasts for a great part of the night. The morning brings grey clouds and at about 8AM it starts raining again, so we decide to stay put. Well rested and fed we start cycling the next day – luckily in dry conditions – and again time on the road passes by very fast. The road to Santa Rita is a beautiful one, a lot of turns, some uphill and downhill, some miradors – some with a rather peculiar view, from time to time a little settlement with a local despensa y bar. After an excellent nights sleep, we wake up to a very sunny – and warm – morning. We´ll be riding in an oven – again. The next village is El Soberbio, some 75km away, which will probably take us two days, depending on the amount of uphill riding we have to do. 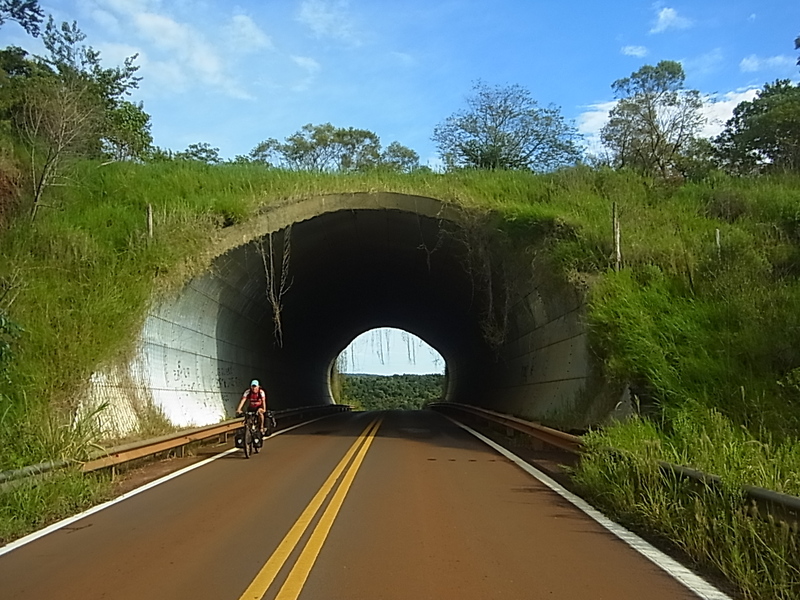 Cycling is still beautiful and quiet, as the whole Ruta 2 has been for the last days. 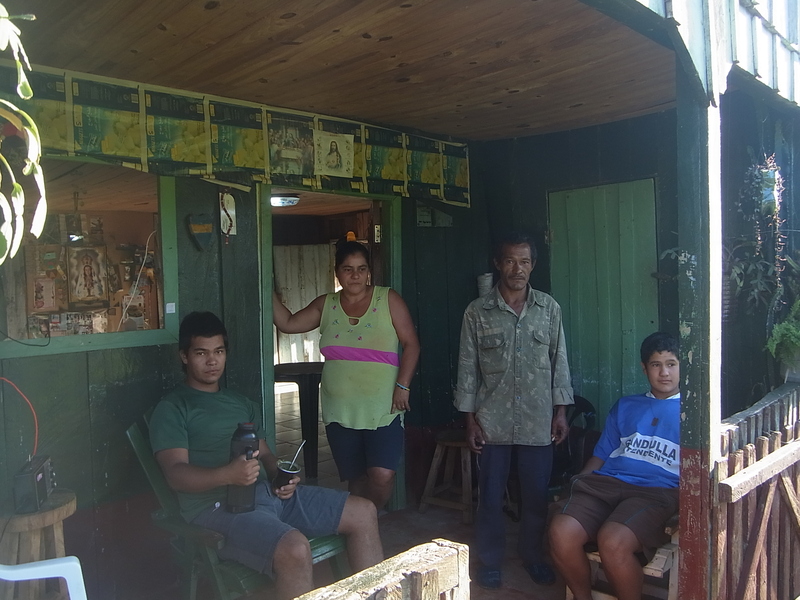 Natalio used to run the farm with Soja plantations, pigs and chickens and sold wood to lumber factories. 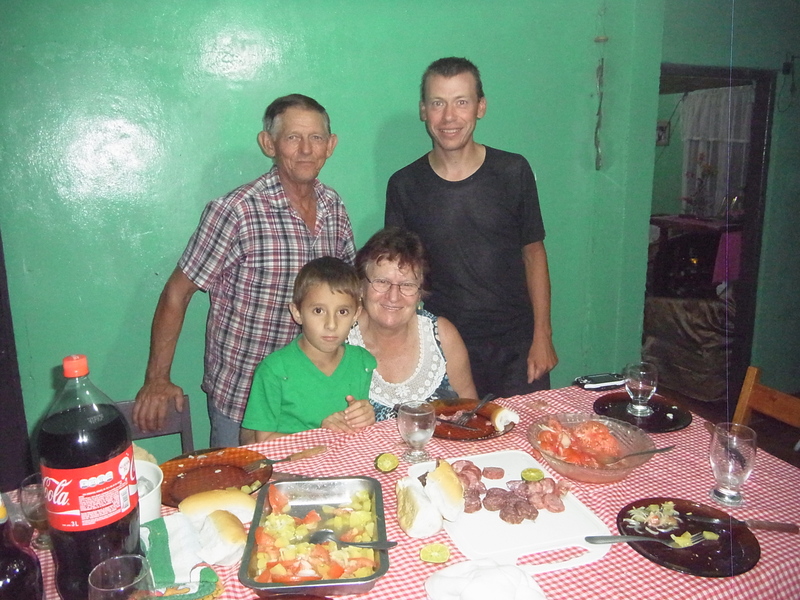 Nowadays two of his sons run the farm and he lives some 200kms away in Posadas, but he can´t really let go, visits them regularly and continues working a little bit. His third son studies music in Buenos Aires and had already engagements, one of them in Lübeck, Germany. 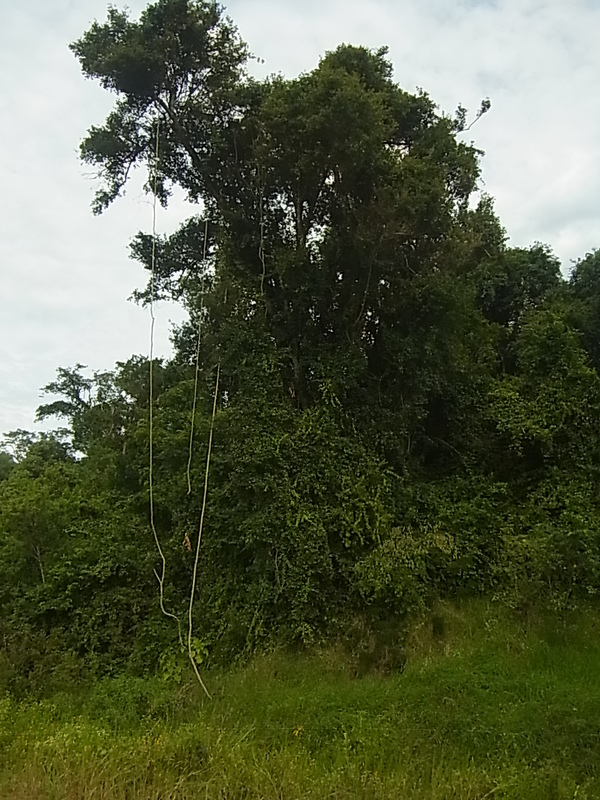 Meanwhile Natalio takes us with his pick-up to a small waterfall behind his property, about 1 km away. 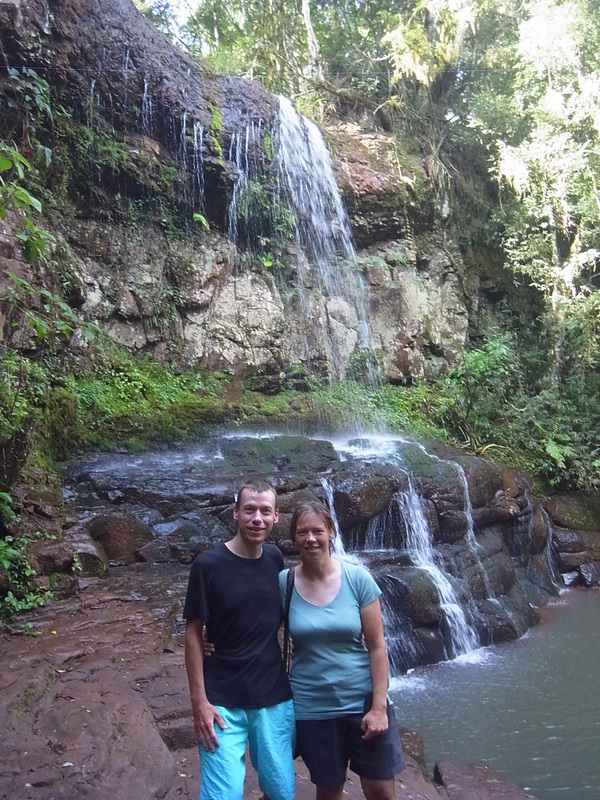 Next to the red earth and the Jesuitic ruins, waterfalls are the third thing Misiones is famous for. 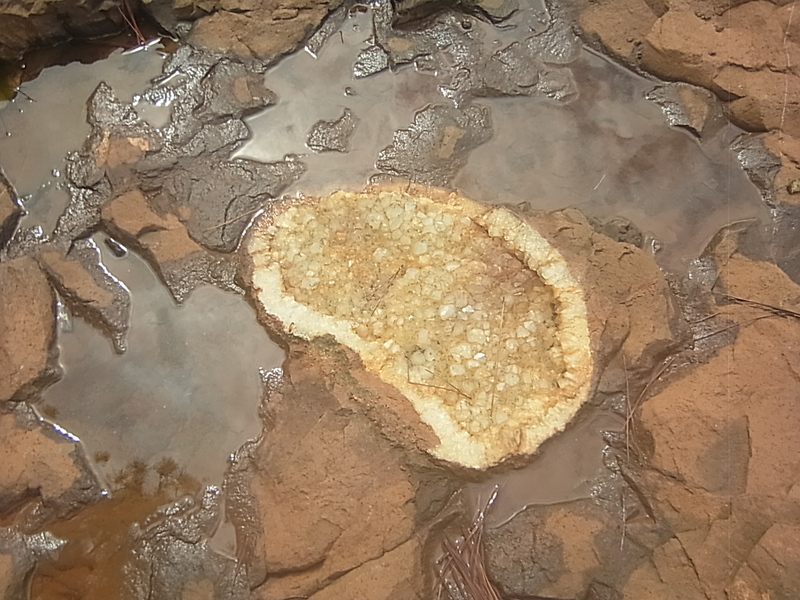 There are several ones in all sizes, including the “Catarates de Iguazu” as the biggest ones. 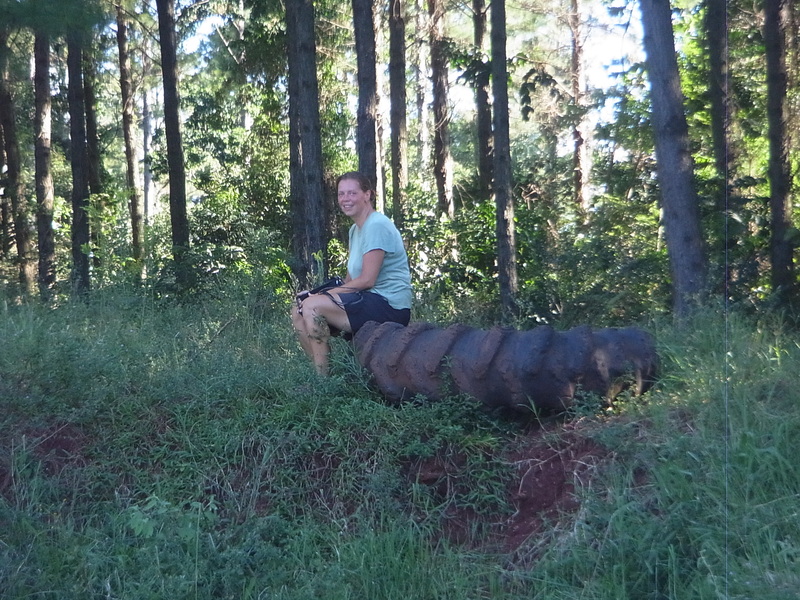 They are even the biggest of the world and will be our final destination in Argentina for this time around. 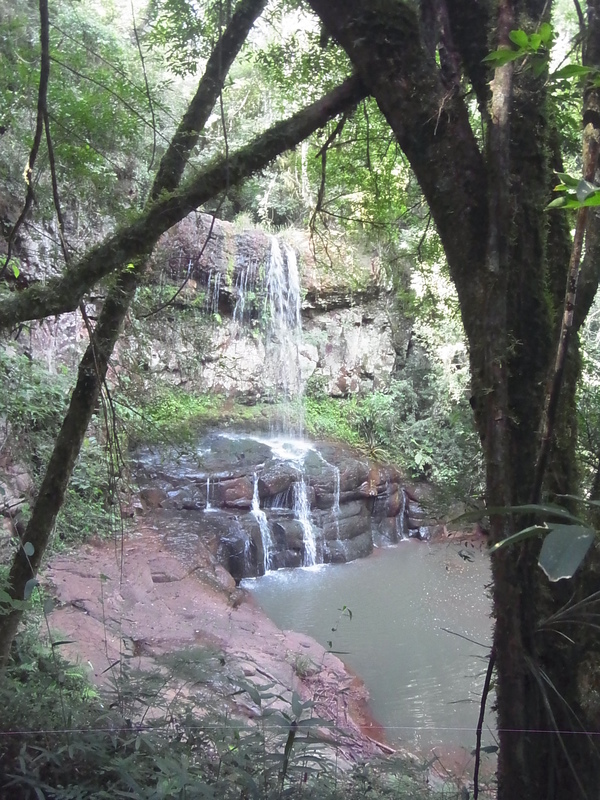 This waterfall here, though small, is very nice and provides a natural pool. 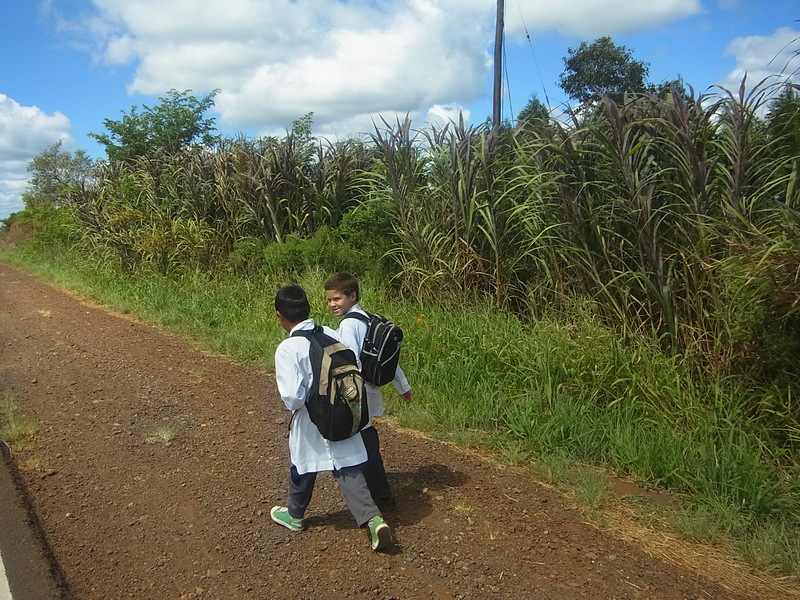 Along the way, Natalio shows us different plants and herbs and tells us about the functions they have. 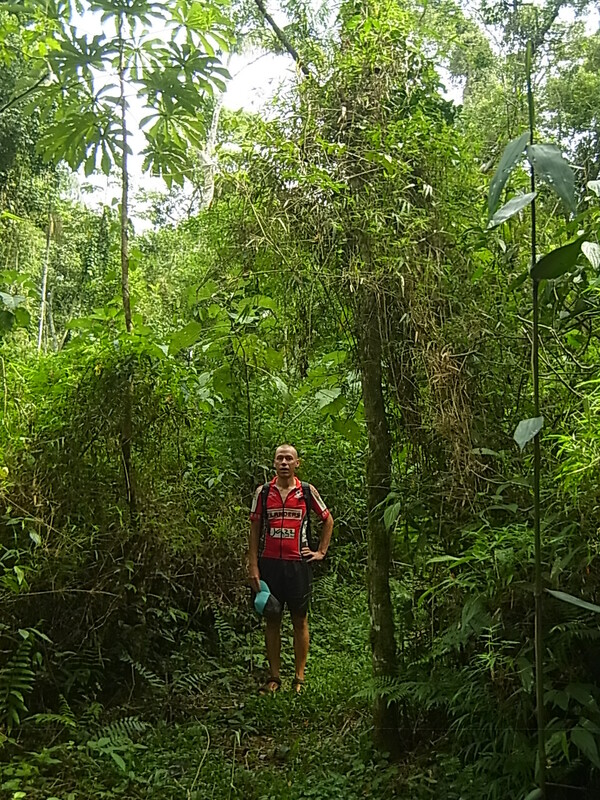 He has a great knowledge about the surrounding nature and it´s interesting listening to him. 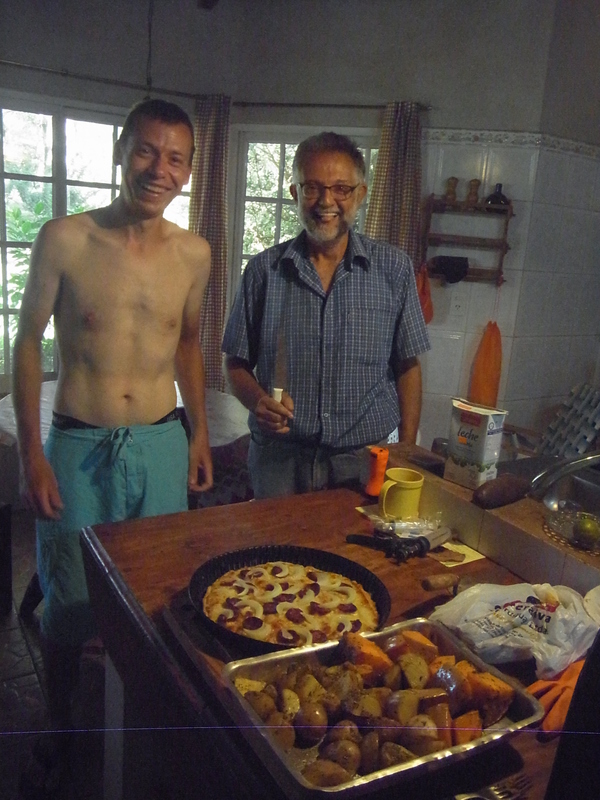 Back at his house, we prepare an improvised meal of pizza with baked potatoes and pumpkin on the side and have lunch together. Like with Alfredo and his family, this unexpected generosity and kindness to almost strangers is nearly unbelievable! In the afternoon, at about 3PM we take off and cycle the last 15 straneous km to El Soberbio, where we go to Camping Puerto Do Mario. 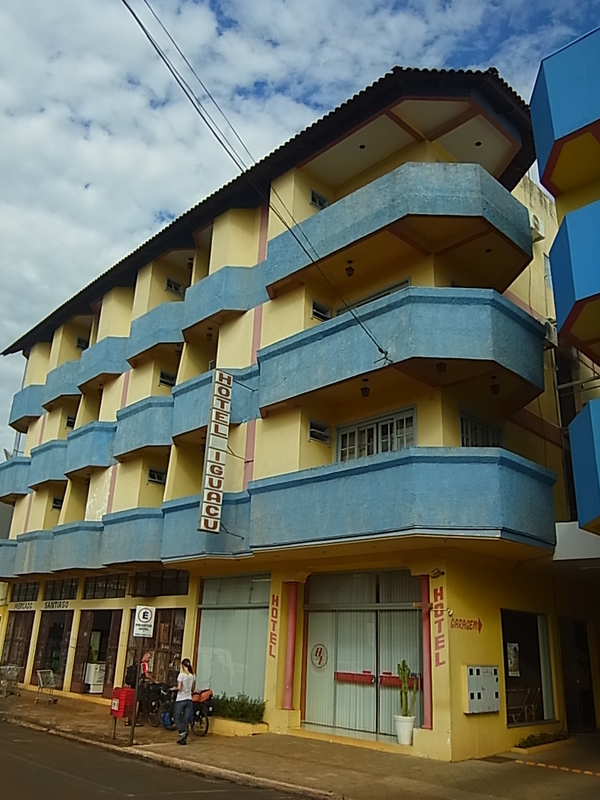 We wouldn´t have found it without advice of Natalio, but are very happy with it: next to the river, quite, not very far away from the centrum of El Soberbio, hot showers and even internet for a very reasonable price. 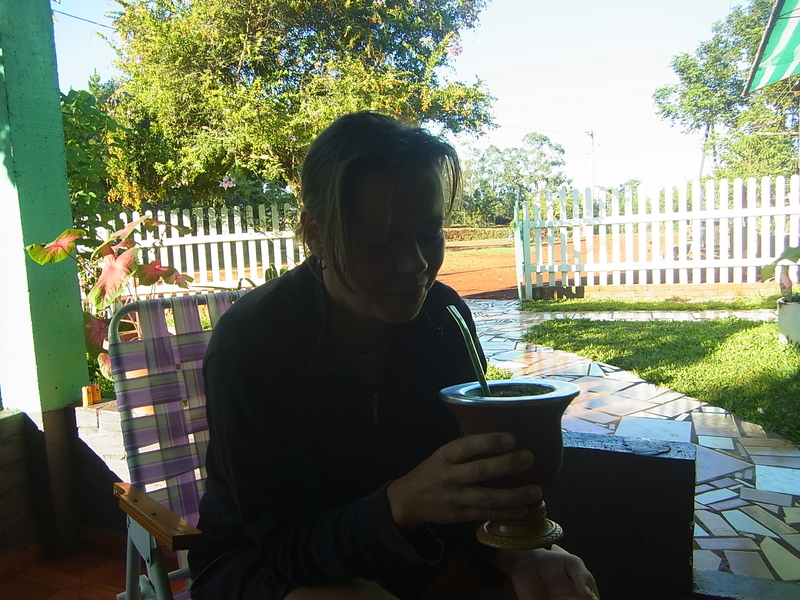 In contrary to our relaxed time in Uruguaiana, the first days in Argentina are not so smooth. 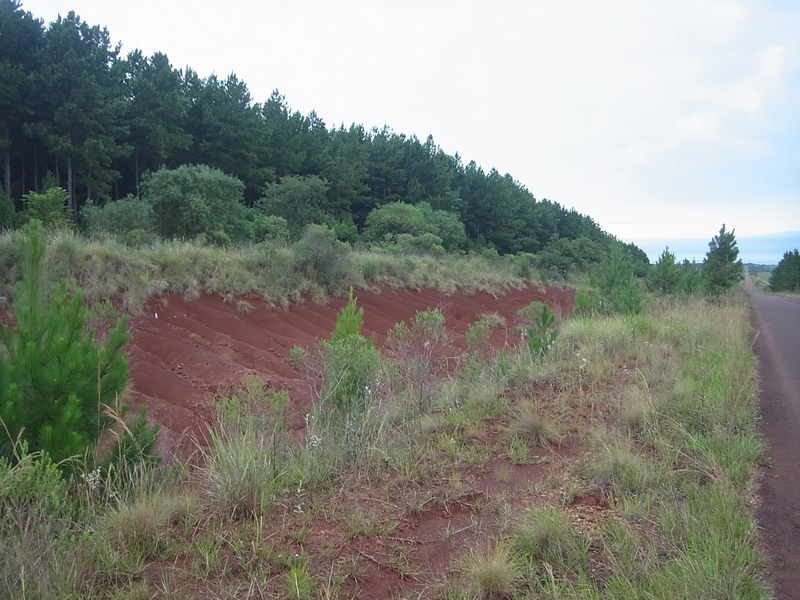 First we want to take a shortcut from Paso de los Libros (border city in Argentina) to the Ruta 14 and find ourselves on an unpaved road which consists of big stones, sand and dry earth and is very hard to cycle. 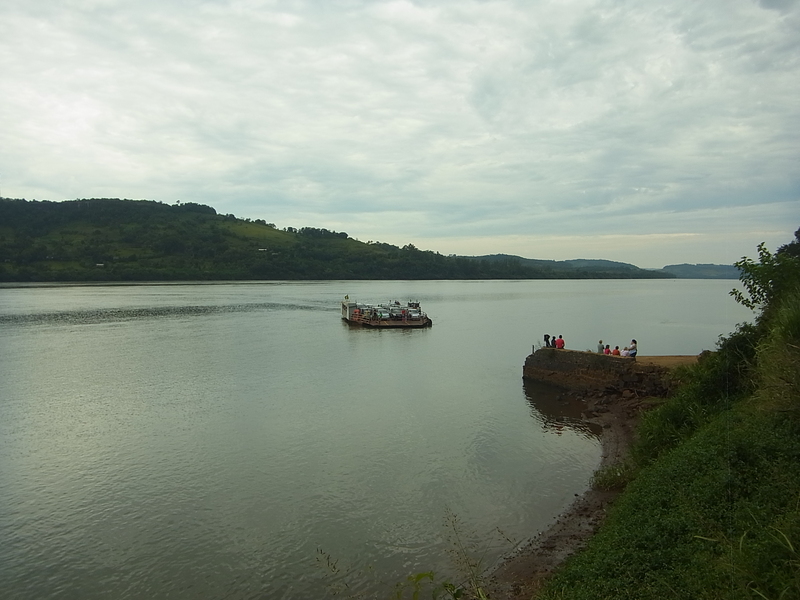 We need more than two hours for the first 15km, than a Pick-up appears out of nothing and offers us a lift. The nice people – wearing Securitas-jackets – drop us off at the crossing with the Ruta 14, where we enjoy a welcome cold drink in a kiosco and have lunch. 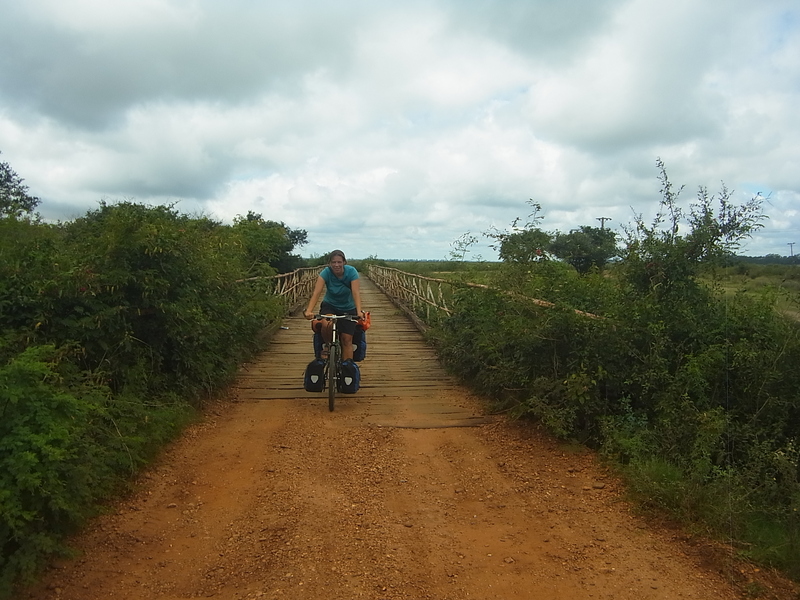 After some 45min, we spot another bicycle trekker on the road, the first one we see in South America. 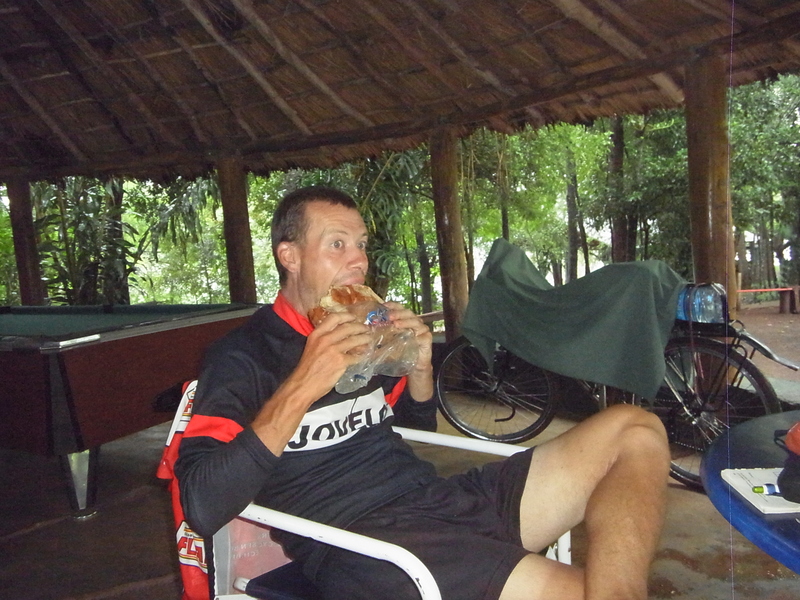 Turns out te be a German woman, Dorothee, who is already 2 years on the road cycling the world. 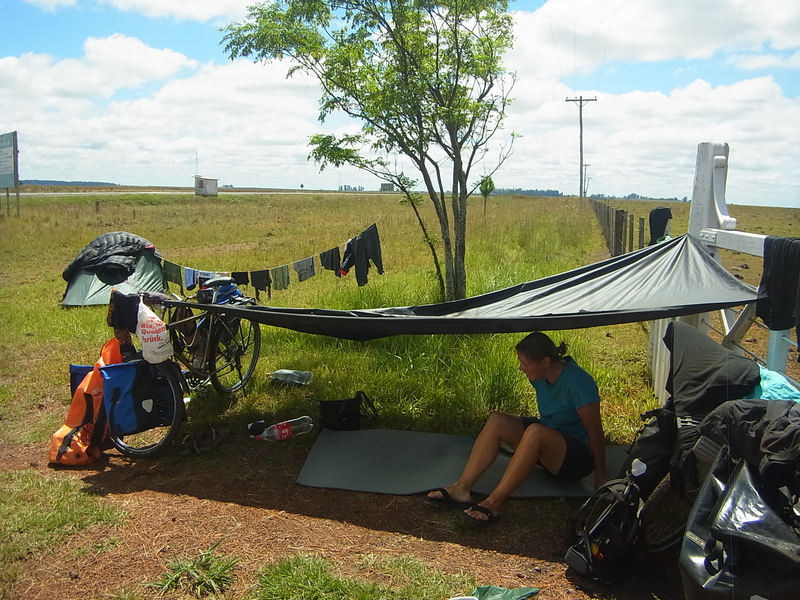 We talk a little bit, than she moves on while we finish our lunch and prepare to go back cycling along the Ruta 14. Its one of the main South-North-connections in Argentina and always very busy with lots of trucks passing by. The first time we were in Argentina and cycled along it we still had the “luxury” of sidelanes, but this time we have to use the street which is much more stressful. 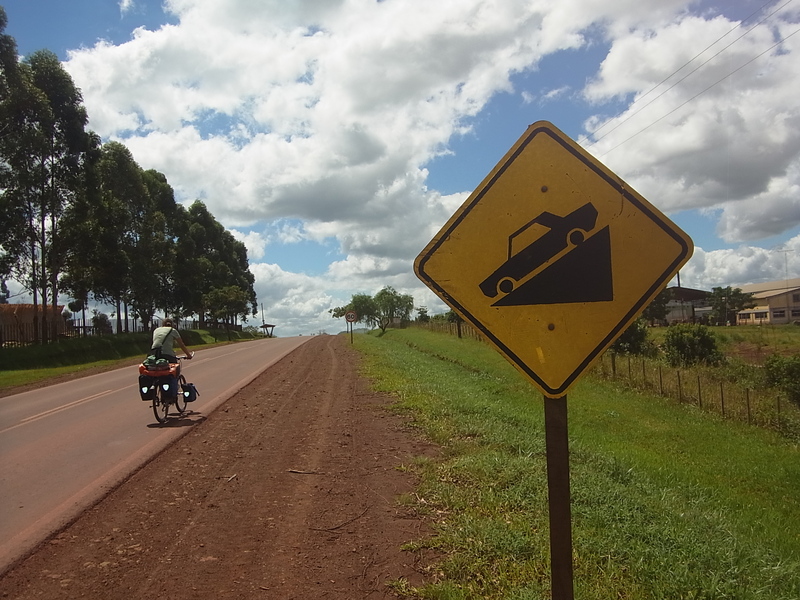 Cars speed by with 100 or more km/h, trucks which won´t use their brakes instead use their horns and we have to jump regularly from the street onto the grass besides since we don´t want to find out if they would really run us over. 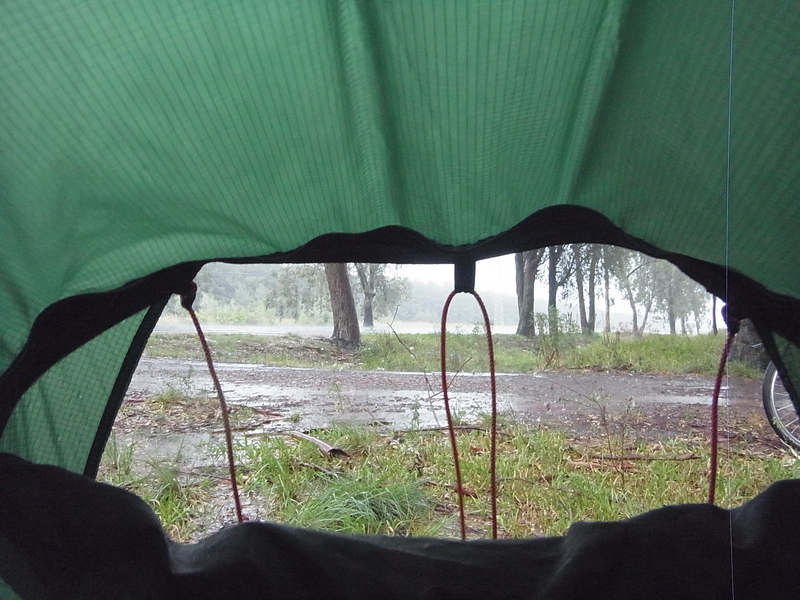 Furthermore, there is absolutely no chance to find a quite campspot, no gas station, no side roads, absolutely nothing. 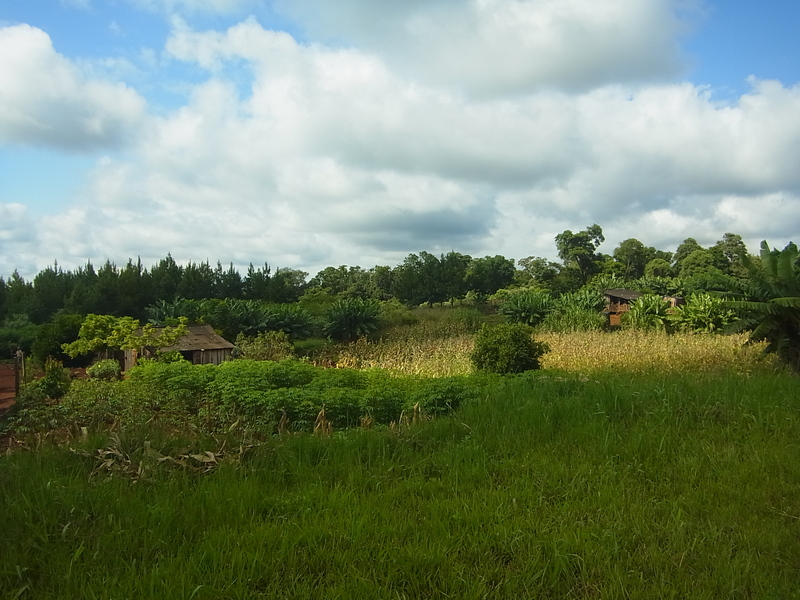 We spent two nights directly next to the road, the first at a small private shrine, the second behind some bushes which provide a little shelter from being seen from the road but not from the noise which goes on the whole night. 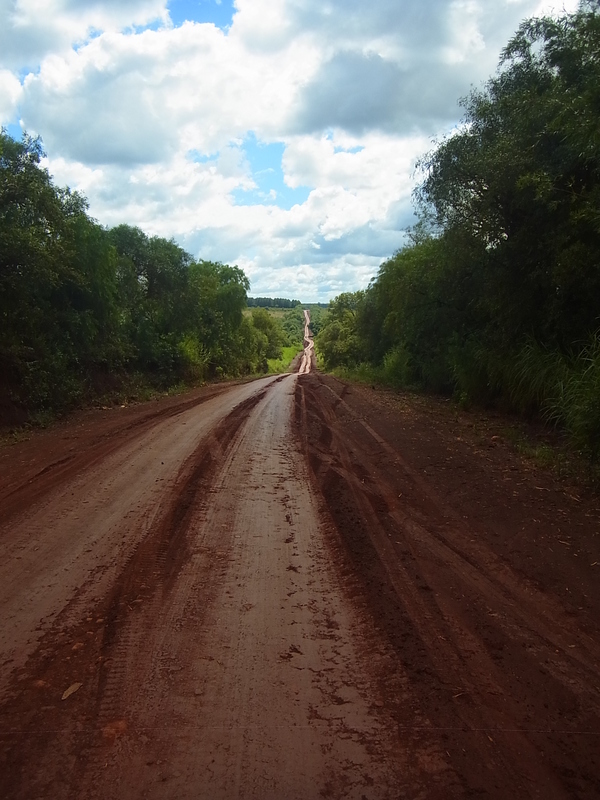 After two days and nights we are totally fed up with the Ruta 14 and head to Santo Tome, the first possibility to leave it and go on North on smaller roads which are more quiet. 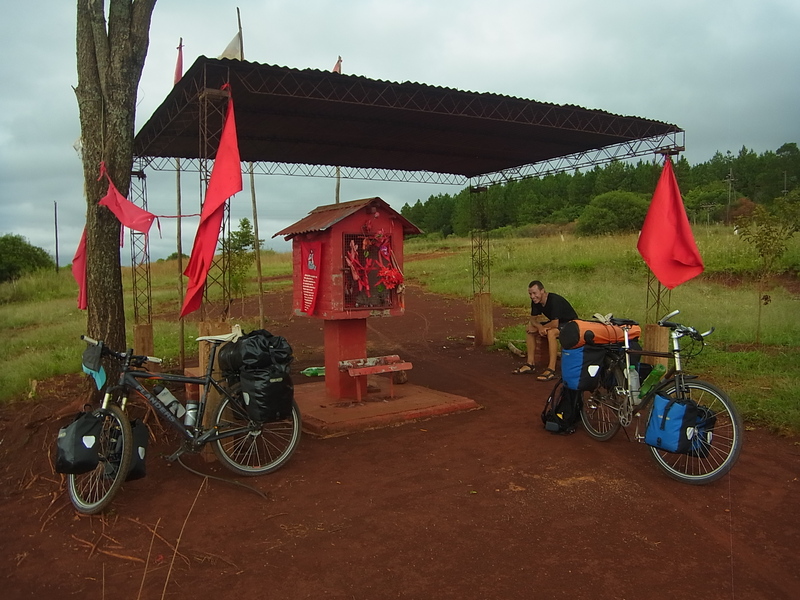 We cycle on and ask in a Gomeria (tyre shop) just before the village if there is a camping in town. The owner offers us instead to camp next to his shop and tells us that there are free showers 100m further in the gas station. 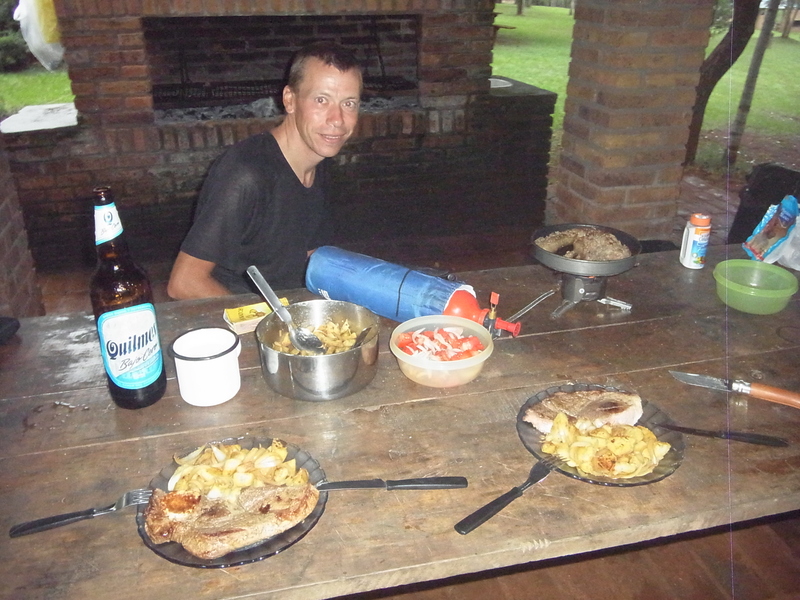 We enjoy the refreshing shower, a selfcooked dinner and a cold beer at the local comedor, then we go to sleep, looking forward to a quite night. But again, the night is not for sleeping. This time it´s not the cars but loud music which wakes us up around midnight. 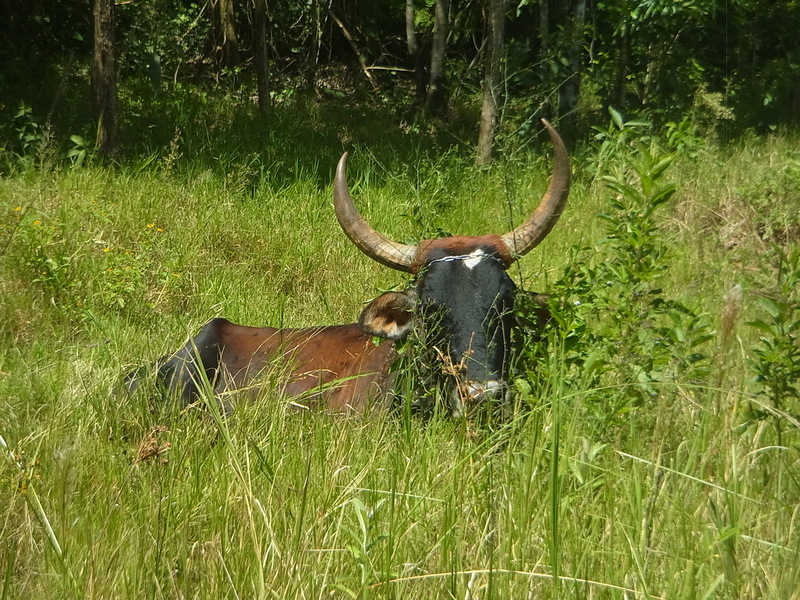 Very loud music, only five meters away from our tent. We only start cycling in the afternoon and our decision to leave the main road was obviously one of our bests´. As soon as we leave town there are almost no cars anymore. The road pavement is in a very bad condition and only a few trucks loaded with wood fight their way along it. We don´t have much problems, there is still enough pavement left so we can slalom our way through. 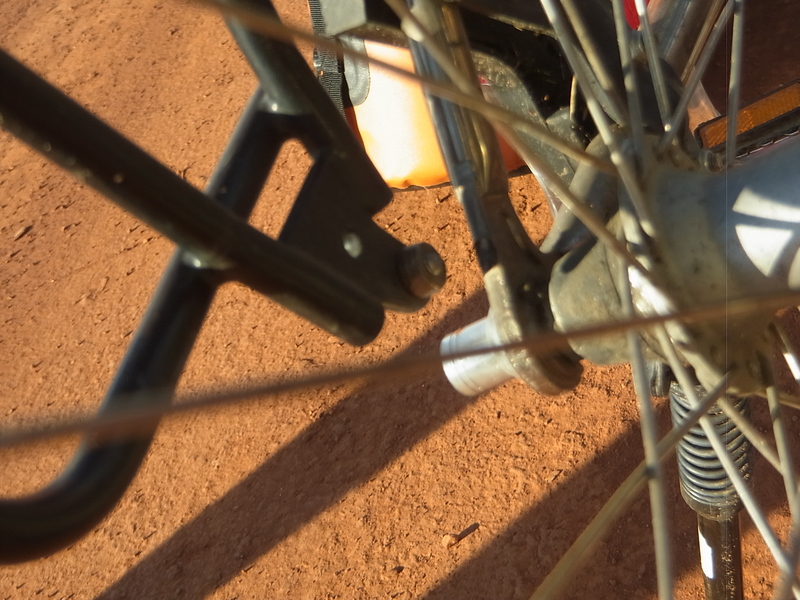 But than, half an hour later, weird sounds come from my (Katharina) bike and I discover that one of the connection points between the bicycle frame and the rear baggage carrier is broken. 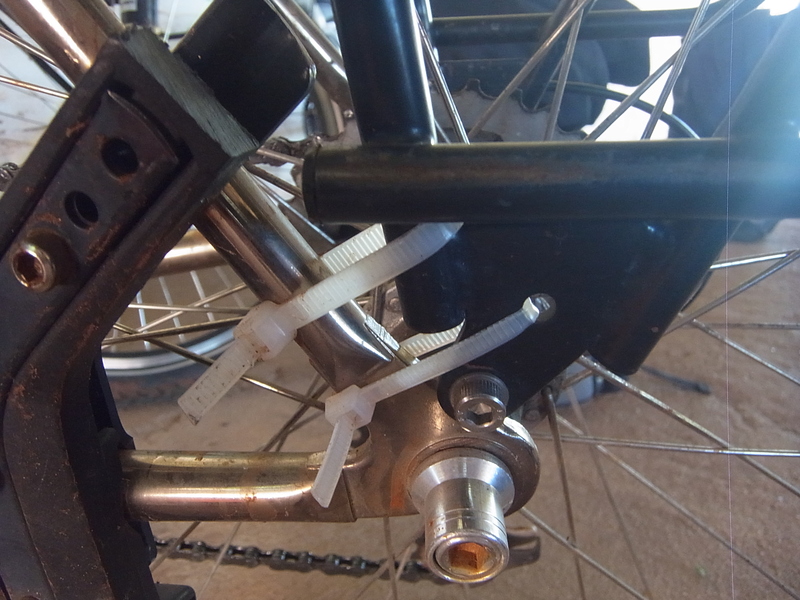 It´s crazy, we carry around 2-3kg of spare and reparation parts and the first thing that brakes is this little but important piece which is not repair- or replaceable. We continue our way and half an hour later the next alarm. 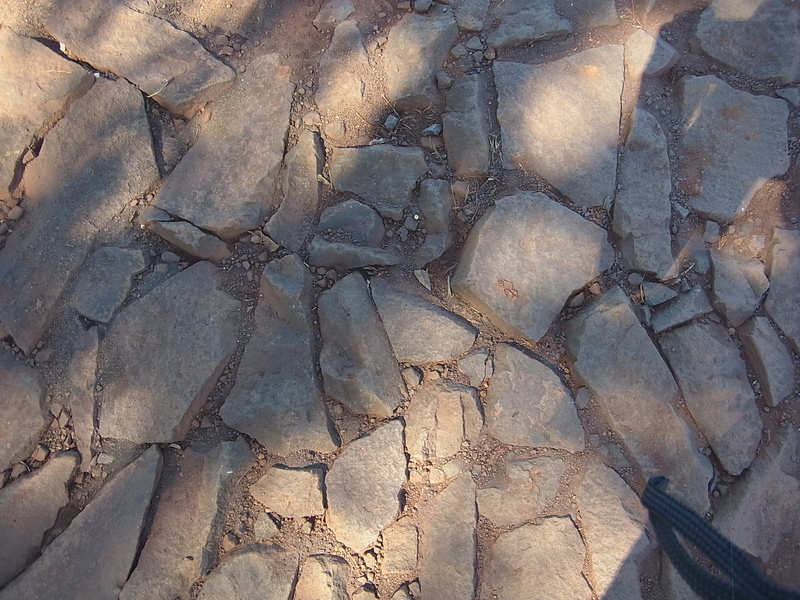 As I reach for my backpack to take out the camera, it´s not there. Obviously I forgot it where we fixed my bicycle. Bram speeds back (without his luggage) while I wait and have one of the longest 40min of the journey. Great relief as Bram re-appears with my bag and everything still in it! 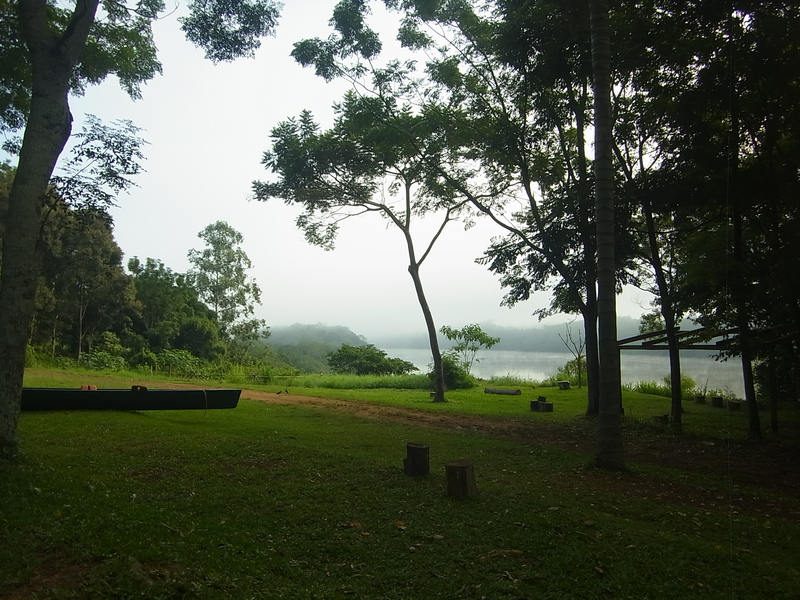 We finish the day a little bit later, find a nice campplace and have the best night since leaving Brazil, happy that finally everything turned out fine. The following days travelling becomes easy and nice as it always should be! 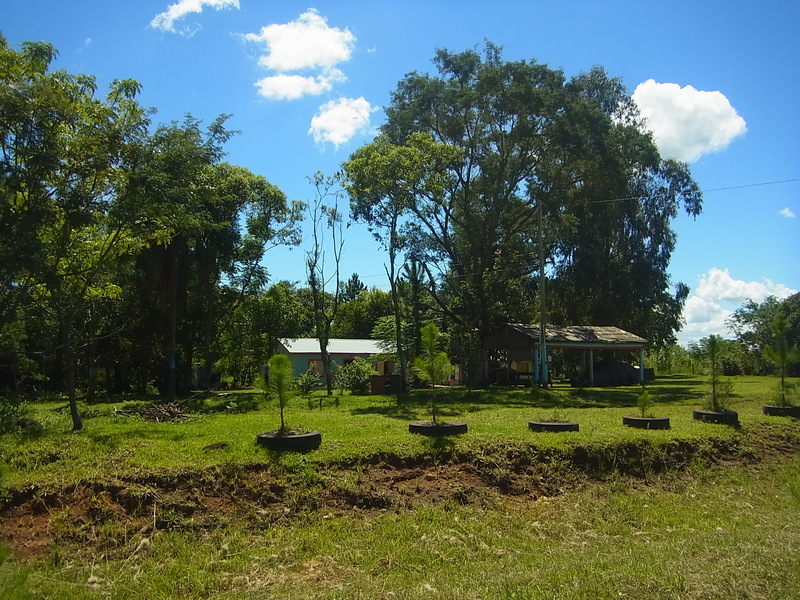 From time to time we pass a lumber factory or one of the very common sanctuaries for “El Gauchito” (where people put down flowers, drinks and food for a safe journey) and than take a rest in the shadows. 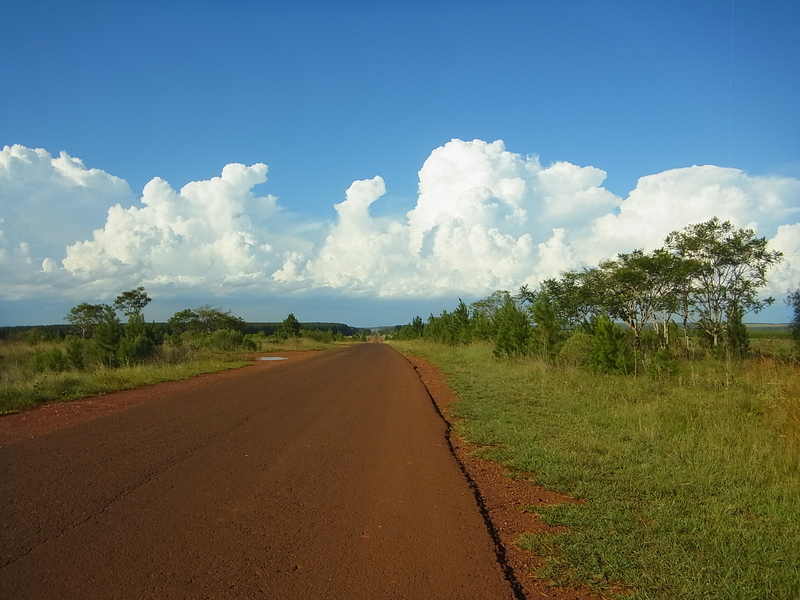 Near the small village Azara we get our first experience with the combination of unpaved roads, the red earth of Misiones and rain. 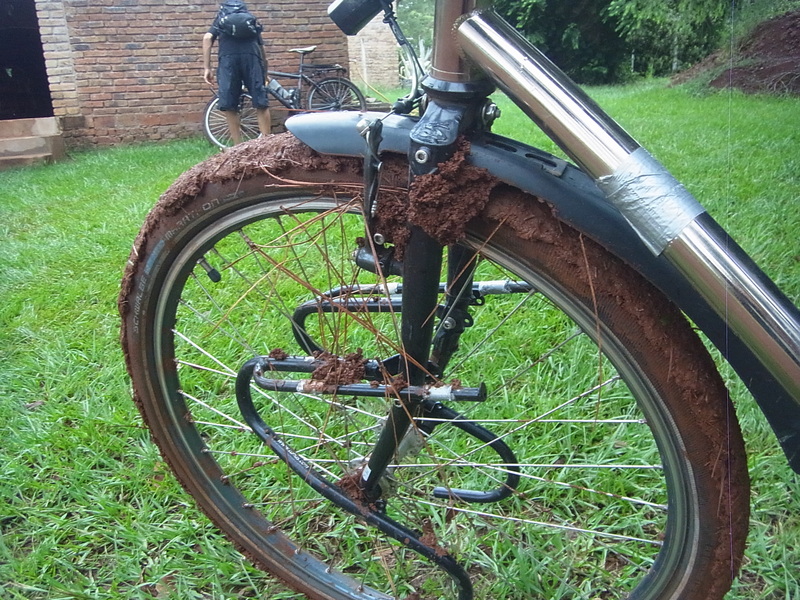 The result is a dark red sticky mess which makes cycling impossible and is very hard to wash away (from the bikes and from ourselves). 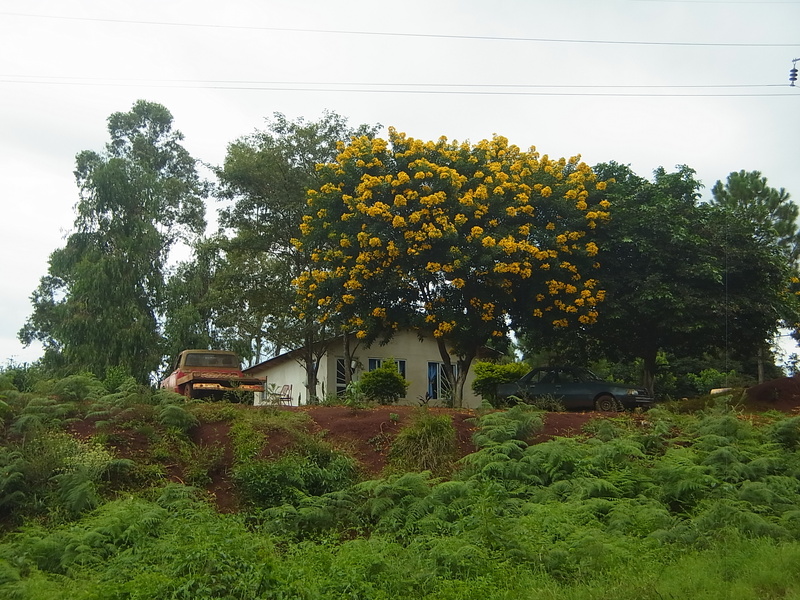 We find a nice “Granja” (small farm) for camping and are not really sad to stay until the rain stops two days later since we find ourselves in a rather luxury leisure resort, with swimming pool, volleyball field, a cafeteria with a huge terrace and a lot of covered seating places with parrillas. 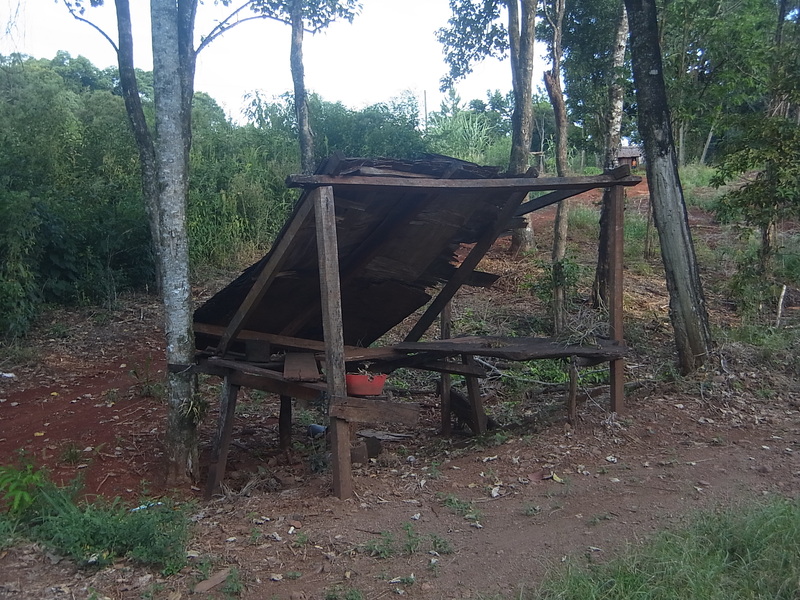 The last ones are the only ones we really use because it rains most of the time but they provide comfortable shelter. We have a lazy time, playing cards, reading and cooking delicous food. 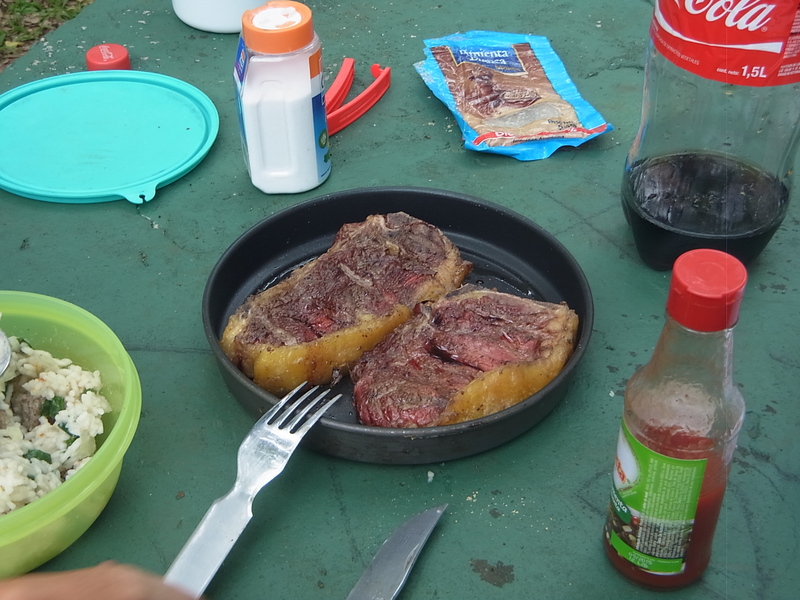 In the local Almacen we´ve discovered the low prices for meat and for the first time we make an argentinian parilla with steak and sausage, accompanied by tomatoes, onions, fried potatoes, mustard and a cold beer. As we leave finally, we even don´t have to pay anything: “Regalo de Argentina” as the owner puts it. During the following days we will find this kindness very often, it seems to be quite typical for the people in this area. On the way to the next village we try again to cycle a shortcut and this time it works out. 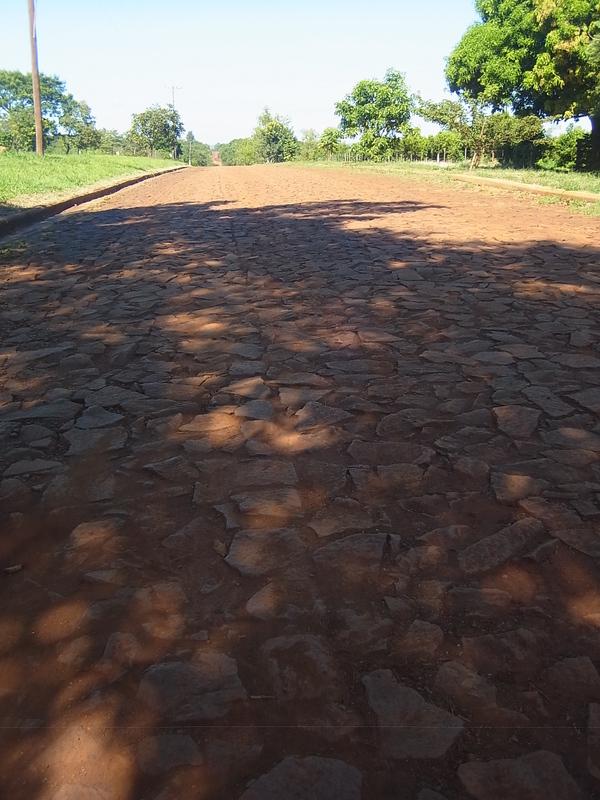 The road is non-paved but very well hardened, and is actually fun to ride except a small part where we meet the Argentinian version of cobble stones, which are horror: a lot of misshaped pieces of rock thrown on the street and flatened a little bit, but really just a little bit. 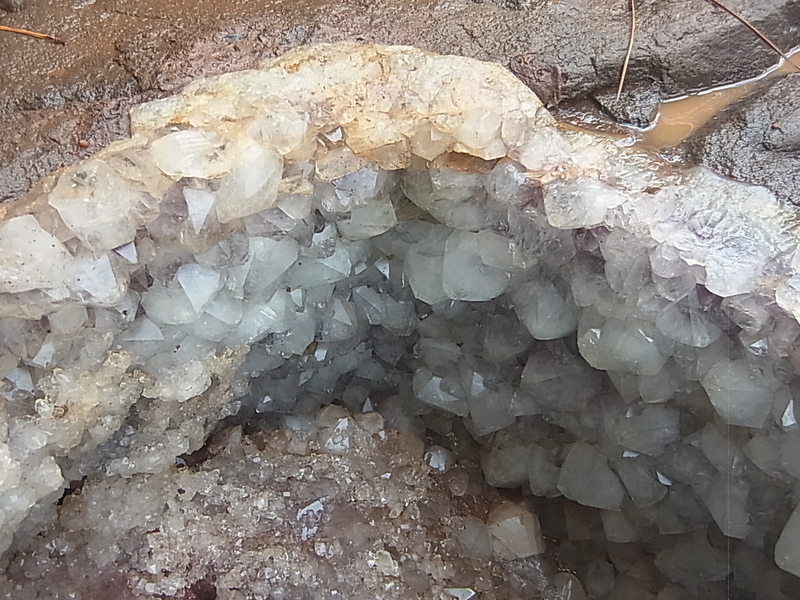 The sharp edges of the stones are a challenge for our tyres but we get over them without harm. Afterwards cycling is easy again and we continue our way north. 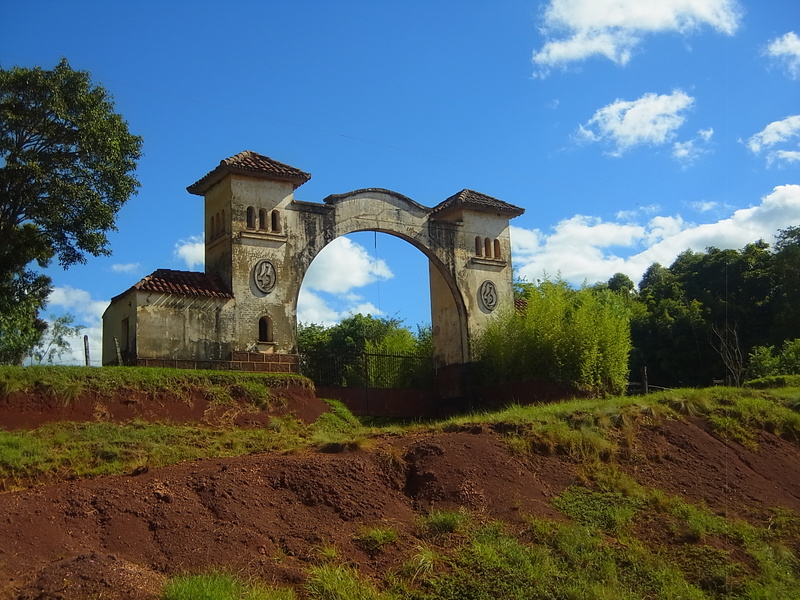 Misiones is well-known for his old ruins of Jesuitic Monesteries, some of them are really well-kept touristic hotspots while others consist only of a few forgotten parts among the landscape. Nowadays the connection to god is obviously still very good. 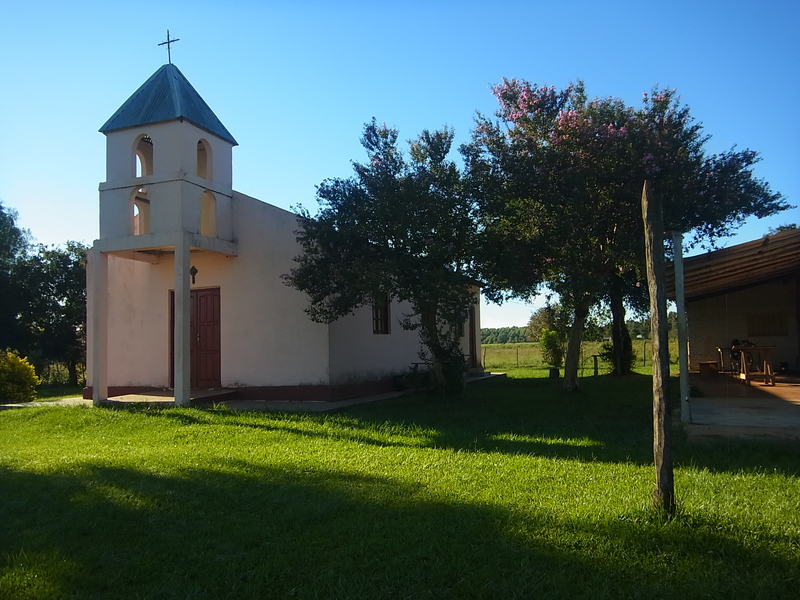 There are an uncountable amount of small churches along the road and most of them look well-kept and used. In the evening we ask at one of them if we can set up our tent next to it and get the permission from the padre. 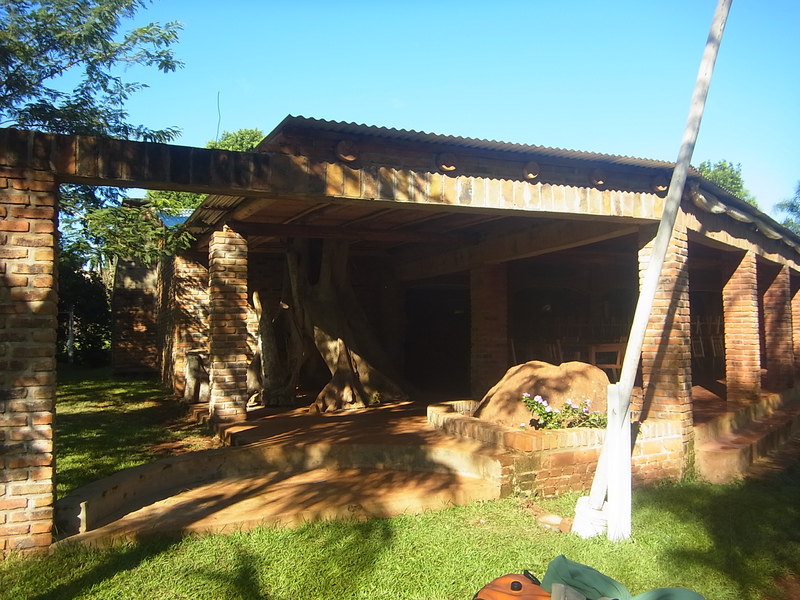 At other occasions we spend our siestas next to them, there is always some kind of “party-shed” with tables and chairs and it´s much more comfortable than the bus-stops, which are rather devasteted in Misiones. Oké gasten, nu zijn jullie goe bezig. Mensen ontmoeten, lokale gerechten eten, genieten van de omgeving en luieren als je niks beter te doen hebt :-). Keep up the good work! 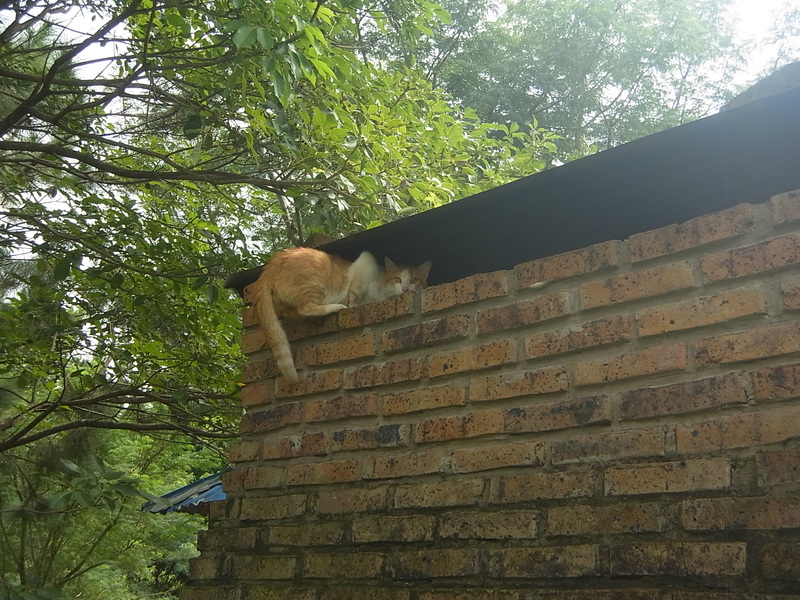 Beste foto tot op heden die ik zag: jullie beiden aan de waterval, perfect plaatje. hey, hey, eindelijk nieuws over jullie. Zo te zien stellen jullie het geweldig, wat me veel plezier doet. Jongens, wat een avontuur, wou dat ik in jullie plaats was. Argentijnse biefstuk is precies een goei regime. Schoon foto’s. Alles nog OK? Dag Timme, alles ok, nog geen moment spijt van mijn nieuwe leven, bevalt me opperbest. Merci voor de toffe commentaar. Prachtig wat jullie allemaal al gezien hebben! En ook de vriendelijkheid van de lokale bevolking is verbazend. Ik wens jullie nog veel reisplezier (en fietsgenot) en blijf jullie verdere avonturen opvolgen. Vele groeten aan jullie allebei.